掩模、容器和制造装置通过对大面积基板进行选择性的蒸镀，本发明提供了掩模精度高的大型掩模。 Mask, and the container manufacturing apparatus of large area substrates by selective vapor deposition, the present invention provides a high precision mask a large mask. 本发明将掩模本体固定在固定位置处，该固定位置是设置在通过掩模框架的热膨胀中心的线上的。 The present invention is fixed to the mask body at a fixed position, the fixing location is arranged on a line through the center of the thermal expansion of the mask frame. 还有，在本发明中，使掩模本体和基板固定，通过使蒸镀源沿X方向或Y方向移动来进行蒸镀。 In the present invention, the mask body and the fixed substrate, the deposition is performed by vapor deposition source is moved in the X or Y direction. 这种使蒸镀源沿X方向或Y方向移动的方法适合于大型基板的蒸镀。 Such vapor deposition source is moved in the X or Y direction of the vapor deposition method is suitable for large substrates. 本申请是申请日为2004年4月12日、申请号为200410034321. X、发明名称为"掩模、容器和制造装置"的发明专利申请的分案申请。  This application is filed April 12, 2004, Application No. 200410034321. X, is a divisional application entitled "mask, and container manufacturing apparatus" of the invention patent application. 本发明涉及在可通过蒸镀法成膜的材料（以下称为蒸镀材料）的成膜过程中所用的成膜装置以及配备了该成膜装置的制造装置。  The present invention relates to a film forming process may be the deposition apparatus (hereinafter referred to as a deposition material) by deposition of a material used in the vapor deposition method and a manufacturing apparatus equipped with the film deposition apparatus. 特别而言，本发明涉及通过在基底对面设置的蒸镀源而使蒸镀材料蒸发成膜由此进行蒸镀时所用的掩模、贮存蒸镀材料的容器以及制造装置。 In particular, the present invention relates to a vapor deposition source provided opposite to the substrate during the deposition material is evaporated thereby forming a mask used for vapor deposition, the vapor deposition material storage container and a manufacturing apparatus. 以具有轻薄性、高速响应性、低直流电压驱动等特性的有机化合物作为发光体的发光元件，是新时代平面显示器应用所期待的。  In an organic compound having a property of light, high speed response, direct-current low voltage driving, etc. as a light emitting element luminous body, a new era of flat panel display applications are expected. 特别而言，使发光元件按矩阵方式设置的显示装置与以前的液晶显示装置相比，考虑到其视角宽、视觉效果优异，从这些方面而言它具有优越性。 In particular, the light emitting element disposed in a matrix display device with a liquid crystal display device as compared to the previous, taking into account a wide viewing angle, excellent visual effects from these respects it is superior. 发光元件的发光原理是，将含有有机化合物的层夹在一对电极之间，通过施加电压，使从阴极注入的电子和从阳极注入的空穴在有机化合物层内的发光中心处发生再化合而形成分子激子，该分子激子在返回基态时会放出能量而产生发光现象。 Emitting principle  The light emitting element is a layer containing an organic compound is sandwiched between a pair of electrodes by applying voltage, the electrons injected from the cathode and the light emission center of the holes injected from the anode in the organic compound layer recombination occurs to form molecular excitons, when the molecular excitons return to the ground state releases energy will produce luminescence phenomenon. 就激发态而言，已知存在着单重态和三重态，无论通过哪个激发态都可以发光。 To the excited state, it is known the existence of singlet and triplet states, whichever may be excited by a light. 在将这种发光元件按矩阵方式设置而形成的发光装置中，可以利用无源矩阵驱动(简单矩阵型）法和有源矩阵驱动（有源矩阵型）法之类的驱动方法。  In the light emitting device according to the light-emitting element arranged in matrix form, may be utilized passive matrix driving (simple matrix type) and an active matrix drive method driving method (active matrix type) method or the like. 但是，在增加象素密度的情况下，针对每个象素（或1个点）逐个设置开关的有源矩阵型方法，考虑到它可以低电压驱动，因此是有其优越性的。 However, in the case of increasing the pixel density, individually set for each pixel (or a dot) of an active matrix type switching method, considering its low voltage driving, and therefore it has its superiority. 还有，含有有机化合物的层具有以[空穴传输层/发光层/电子传输层]为代表的叠层结构。  Further, an organic compound layer having a laminate structure comprising [a hole transporting layer / light emitting layer / electron transport layer] represented. 还有，形成EL层的EL材料大致分为低分子系（单体系）材料与高分子系（聚合物系）材料，低分子系材料能利用蒸镀装置成膜。 There, EL material forming the EL layer are roughly classified into a low molecular (monomer type) materials and polymeric (polymer based) materials, low-molecular material capable of forming the deposition apparatus. 以前的蒸镀装置，在基板托座上设置了基板，并装备了填充有EL材料即蒸镀材料的坩埚（或蒸镀皿）、防止升华性EL材料上升的开合门、加热坩埚内的EL材料用的加热器。  before the vapor deposition apparatus, the substrate holder seat provided in the substrate, and equipped with a filling material, i.e. a crucible EL material deposition (or vapor deposition boat), prevent the rise of the EL material sublimation door opening and closing, heating the heater EL material used in the crucible. 然后，使通过加热器加热的EL材料升华，由此在旋转的基板上成膜。 Then, the EL material heated by the heater sublimation, whereby rotation of the film formation on the substrate. 此时，为了均匀地进行成膜，基板和坩埚之间的距离要隔开至少lm。 In this case, for uniform film formation, a distance between the substrate and the crucible to be separated by at least lm. 在以前的蒸镀装置和蒸镀方法中，在通过蒸镀法形成EL层时，升华的EL材料大部分会附着在蒸镀装置成膜室内的内壁、开合门或防粘屏蔽板（为了防止蒸镀材料附着在成膜室内壁上而设置的保护板）上。  Before deposition method and the vapor deposition apparatus, when the EL layer is formed by vapor deposition, most sublimated EL material adheres to the inner wall of the vapor deposition apparatus of the deposition chamber, or release the door opening and closing shield plate (protective plate in order to prevent the deposition chamber wall provided in the vapor deposition material is attached). 因此，在EL层成膜过程中，昂贵的EL材料的利用率非常低，最高约为1%，所以发光装置的制造成本非常高。 Thus, the EL layer forming process, the utilization of the expensive EL material is very low, up to about 1%, the manufacturing cost is very high light-emitting device. 还有，在以前的蒸镀装置中，为了获得均一的膜，基板和蒸镀源之间要至少间隔lm。  Further, in the previous deposition apparatus, in order to obtain a uniform film, between the substrate and the evaporation source to be separated by at least lm. 还有，在大面积基板的情况下，很容易会产生基板中央部位和边缘部位的膜厚不均一的问题。 There film thickness, in the case of a large area substrate, it is easy to produce a central portion and a peripheral portion of the substrate unevenness problem. 进一步而言，该蒸镀装置是使基板旋转的结构，所以该蒸镀装置在大面积基板适用性方面有其局限性。 Further, the vapor deposition apparatus is rotating the substrate structure, the deposition apparatus has its limitations in the applicability of the large area substrate. 而且，如果使大面积基板和蒸镀用掩模在紧密接触的情况下同时旋转的话，掩模和基板之间有可能会产生位置偏差。  Further, when the large area substrate and a vapor deposition mask while rotating in close contact with the case, then there may occur between the mask and the substrate position deviation. 还有，基板和掩模等在蒸镀时受到加热，会因为热膨胀而使其尺寸发生变化，因为掩模和基板的热膨胀率不同，所以尺寸精度和位置精度等会产生降低。 Further, the substrate and the mask being subjected to heating during the deposition, because of thermal expansion so that changes in size, because of the different thermal expansion coefficients of the mask and the substrate, the size and positional accuracy, etc. reduce generated. 鉴于这些问题，本发明人提供了蒸镀装置（专利文献1、专利文献2)，由此作为解决前述问题的一种措施。  In view of these problems, the present invention provides a vapor deposition apparatus (Patent Document 1, Patent Document 2), whereby as a measure to solve the aforementioned problems. 本发明提供了配备有蒸镀装置的制造装置，其是一种通过提高EL材料的利用率而降低制造成本，同时在EL层成膜均一性和生产率等方面表现优异的制造装置。  The present invention provides a manufacturing apparatus equipped with a vapor deposition apparatus, which is a reduced manufacturing cost by improving the utilization of EL material, while exhibiting excellent manufacturing apparatus in the EL layer deposition uniformity and productivity. 还有，本发明提供了针对基板尺寸比如为320mmX400mm、370mmX 470mm、 550mm X 650mm、600mm X 720mm、680mm X 880mm、1000mm X 1200mm、1100mm X 1250mm、 1150mmX 1300mm的大面积基板而且EL材料蒸镀效率高的制造装置。  Further, the present invention provides for a substrate size such as 320mmX400mm, 370mmX 470mm, 550mm X 650mm, 600mm X 720mm, 680mm X 880mm, 1000mm X 1200mm, 1100mm X 1250mm, a large area substrate but also the EL material 1150mmX 1300mm evaporated high plating efficiency of the manufacturing apparatus. 还有，本发明提供了即使是针对大面积基板，也能够在整个基板表面上获得均一膜厚的蒸镀装置。 Further, the present invention provides a vapor deposition apparatus even for a large area substrate, it is possible to obtain a uniform film thickness over the entire surface of the substrate. 而且，为了针对大面积基板进行选择性的蒸镀，本发明提供了掩模精度高的大型掩模。  Further, in order for selective deposition of a large area substrate, the present invention provides a high precision mask a large mask. 为了解决前述问题，本发明将掩模固定在框架的热膨胀中心上。  In order to solve the aforementioned problems, the present invention is fixed to the mask in thermal expansion of the center frame. 仅在热膨胀中心处用耐温度变化能力强的粘合剂进行局部固定。 Only at the center of thermal expansion with high resistance to temperature changes locally adhesive fixing ability. 该热膨胀中心是由框架的材料、形状以及外周和内周所决定的。 The thermal expansion of the center is determined by material, shape and the inner periphery and the outer periphery of the frame. 还有，采用与基板具有基本上相同的热膨胀系数的材料来形成掩模本体。  Further, using a material to form a mask body of the substrate having substantially the same thermal expansion coefficient. 因为掩模本体能够跟从基板的膨胀状态而发生膨胀，所以能够确保蒸镀位置的精度。 Because the mask body can follow the expansion state of the substrate and expands, it is possible to ensure the accuracy of the deposition position. 在某一温度范围内加热时，框架发生膨胀，即使其外周和内周发生变化，由于固定掩模的位置处于热膨胀中心，所以其对合位置不会发生变化。 When heated within a certain temperature range, the frame expands, even if the outer and inner happened last week changes, the position of the mask fixed in the center of thermal expansion, so it does not change the position of engagement. 还有，本发明在蒸镀时将基板和掩模固定下来而不让其旋转。  Further, the present invention, when the vapor deposition mask and the substrate is fixed without allowing rotation. 蒸镀时，通过使蒸镀源托座沿X方向、Y方向或Z方向移动而在基板上成膜。 During the deposition, by evaporation holder source in the X direction, Y direction or Z direction and formed on the substrate. 本发明所公开的发明构成是掩模，它是具有图案开口的薄板状掩模，其特征在于， 该掩模是在拉伸状态下固定在框架上的，而且，前述掩模是粘结在与通过框架构件的热膨胀中心的线重合的位置上的。  The invention disclosed in the present invention is composed of a mask, which is a thin plate having an opening pattern of the mask, wherein the mask is secured in tension to the frame, and that the mask is bonded with the thermal expansion of the center line of the frame member by overlapping position. 还有，其它发明构成是掩模，它是具有图案开口的薄板状掩模，其特征在于，该掩模是在拉伸状态下固定在框架上的，而且，前述掩模是粘结在与通过框架构件的热膨胀中心的线相比靠外侧的位置上的，在蒸镀时框架因加热而产生膨胀，从而使该掩模保持拉伸状态。  In addition, the mask is composed of other inventions, it is a thin plate having an opening pattern of the mask, wherein the mask is secured in tension to the frame, and that the mask is glued junction and positioned outside on, when the frame vapor generated by heating expands, so that the mask is held stretched state by a linear thermal expansion as compared to the center of the frame member. 在与框架热膨胀中心相比更靠外侧上固定的话，在加热使框架发生膨胀的同时， 掩模本体也会发生拉伸，因此能够防止产生弯曲现象。  In comparison with the frame fixed on the outside of thermal expansion closer to the center, then the frame in the heat expansion occurs at the same time, the mask body also occur stretching, bending phenomenon can be prevented. 即，利用框架的热膨胀作就能够保持掩模的张力。 That is, the thermal expansion of the frame can be maintained as the tension mask. 优选的是边对蒸镀材料进行适当的加热边进行蒸镀，可以决定适当的固定位置，以便在该加热温度下对掩模施加适当的张力。 Preferably the sides of the deposition material suitably with heating vapor deposition, determine the appropriate fixed position, so as to apply an appropriate tension to the mask at the heating temperature. 还有，就前述各个构成而言，前述框架的四角具有曲率也是可以的。  Moreover, the terms on the respective configuration, the four corners of the frame has a curvature are possible. 还有，就前述各个构成而言，其特征在于以具有耐热性的粘合剂将前述掩模粘结在框架上。 Further, the respective terms on the configuration, wherein an adhesive having heat resistance to the adhesive on the mask frame. 还有，前述掩模也可以通过焊接固定在框架上。 Further, the mask may be fixed to the frame by welding. 还有，其它发明构成是容器，其特征在于它是贮存着安装在蒸镀装置蒸镀源上的蒸镀材料的容器，前述容器的平面截面是长方形或正方形的，而且蒸镀材料所通过的开口部分是细长形状的。  In addition, another invention is a container configuration, it is characterized in that the storage container is mounted on a vapor deposition material evaporation source of the vapor deposition apparatus, a cross-sectional plane of the container is rectangular or square, and the vapor deposition material through the opening portion is an elongated shape. 在进行共蒸镀时，为了使蒸发中心对准要进行蒸镀的基板上的一点，设计成使蒸镀源的安装角度自由变化的结构也是可以的。  When co-evaporation is performed, in order to be aligned with the center of the evaporation point of the evaporation source is designed so that the mounting angle freely changed deposited on the substrate structure are also possible. 但是，由于蒸镀源和角度一起发生倾斜，所以具有两个蒸镀源的间隔是必要的。 However, since the vapor deposition source and the angle is tilted together, the spacer having two deposition sources are necessary. 因此，优选将容器制成图10所示的棱柱状，优选通过容器的开口方向来调节蒸发中心。 Thus, preferably the prismatic container is made as shown in FIG. 10, the evaporator is preferably adjusted through the center of the opening direction of the container. 容器由上部分（上部〃_ 7 )和下部分（下部〃_ 7)构成，提供蒸镀材料从开口飞出角度不同的多个上部分，可以进行适当的选择。 Container by the upper portion (the upper 〃_ 7) and a lower portion (lower 〃_ 7) configured to provide a plurality of vapor deposition material from the upper portion of the opening angle of flying different, can be suitably selected. 根据蒸镀材料的不同，在蒸镀扩散面等方面也是不同的，所以在共蒸镀时，最好提供安装有不同的上部分的2个蒸镀源。 Depending on the vapor deposition material in the evaporation diffusion surface, etc. it is also different, so in the co-deposition, it is preferable to provide the installation of two different evaporation sources on the portion. 还有，其它发明构成是制造装置，其特征在于制造装置具有装载室、与该装载室相连的运送室、与该运送室相连的多个成膜室以及与该成膜室相连的设置室，前述多个成膜室与使前述成膜室内形成真空所用的真空排气处理室相连，该成膜室具有固定基板用装置、掩模、固定该掩模用框架、对合掩模和基板位置用的对准装置、1个或2个蒸镀源、使该蒸镀源在前述成膜室内移动的装置、加热基板用装置，掩模的端部是粘结在与通过前述框架边框的热膨胀中心的线重合的位置上的。  In addition, another invention is configured manufacturing apparatus, characterized in that the manufacturing apparatus having a load chamber and the transport chamber connected to the loading chamber, a plurality of film formation chambers connected with the transport chamber and the deposition chamber setting chamber, so that the plurality of film deposition chambers and the deposition chamber to form a vacuum exhaust treatment chamber is connected to the vacuum used, the film-forming chamber having a fixed substrate by means of the mask frame, the mask is fixed, the mask involution and a substrate position alignment device used, one or two evaporation sources, the evaporation source of the apparatus moves in said deposition chamber, the substrate is heated by means of an end portion of the mask is adhered to the frame by of linear thermal expansion of the center frame coincident position. 还有，其它发明构成是制造装置，其特征在于该制造装置具有装载室、与该装置室相连的运送室、与该运送室相连的多个成膜室以及与该成膜室相连的设置室，前述多个成膜室与使前述成膜室内形成真空所用的真空排气处理室相连，该成膜室具有固定基板用装置、掩模、固定该掩模用框架、对合掩模和基板位置用的对准装置、1个或2个蒸镀源、使该蒸镀源在前述成膜室内移动的装置以及加热基板用装置，贮存着安装在前述蒸镀源上的蒸镀材料的容器，其平面截面是长方形或正方形，而且开口部分是细长形状的。  In addition, another manufacturing apparatus constituting the invention is characterized in that the manufacturing apparatus having a load chamber and the transport chamber connected to the chamber means, a plurality of film formation chambers connected with the transport chamber and the deposition chamber the chamber is provided, so that the plurality of film deposition chambers and the deposition chamber to form a vacuum exhaust treatment chamber is connected to the vacuum used, the deposition chamber having a substrate fixing means, a mask, the mask frame fixing, involution cover the mold and the substrate position alignment device used, one or two evaporation sources, that the means for heating the substrate and the evaporation source is moved in the deposition chamber by means mounted on the reservoir with the vapor deposition source container material, which plane is rectangular or square cross-section, and the opening portion is an elongated shape. 就前述构成而言，其特征在于，前述容器是由上部分和下部分构成的，由前述蒸镀源而来的材料的蒸发是通过容器上部分中开口部分的形状来调节的。  For the purposes of configuration, wherein the container is constituted by an upper portion and a lower portion, the evaporation from the evaporation source material is regulated by the shape of the container portion of the opening portion. 还有，前述容器除了具有上部分和下部分以外，内部设置多个开孔的中盖也是可以的。 There are, in addition to the container having an upper portion and a lower portion outside the inner cap disposed in the plurality of openings are possible. 还有，就前述各个构成而言，其特征在于，前述成膜室和前述设置室是与使室内形成真空所用的真空排气处理室相连的，而且具有材料气或清洗气体引入装置。  In addition, it is in terms of the respective constituent, wherein said deposition chamber and said chamber is provided to form a vacuum chamber so that a vacuum exhaust treatment chamber is connected with, and a material gas or a cleaning gas introduction means . 还有，就前述各个结构而言，其特征在于，前述蒸镀源在成膜室内可沿X方向、Y方向或Z方向移动。  Further, the respective terms of structure, characterized in that the vapor deposition source in the deposition chamber can move in the X direction Y direction or Z direction. 还有，就前述各个结构而言，其特征在于，在前述成膜室中具有将成膜室内部分割开来并阻止向前述基板进行蒸镀的开合门。  Further, the respective terms of structure, characterized in that, the deposition chamber having a cut portion and to prevent the opening and closing of the door for vapor deposition to the substrate in the deposition chamber. 图1是表不本发明掩模的斜视图和截面视图（实施方案1)。  Table 1 is a perspective view of the present invention and not a cross-sectional view of the mask (embodiment 1). 图2是表示实施方案2的图。  FIG. 2 is a diagram illustrating Embodiment 2. 图3是表示实施方案3的图。  FIG. 3 is a diagram of the embodiment of FIG. 图4是表示本发明掩模的斜视图（实施方案1)。  FIG. 4 shows a perspective view of the mask of the present invention (embodiment 1). 图5是表示包含多室型制造装置的图（实施例1)。  FIG. 5 shows (Example 1) comprises a multi-chamber manufacturing apparatus. 图6是蒸镀装置的顶视图（实施例2)。  FIG. 6 is a top view (Example 2) vapor deposition apparatus. 图7是表不设直室和运送情况的图（实施例2)。  FIG. 7 is a table does not have a linear transport chamber and the case (Example 2). 图8是成膜室内部的顶视图（实施例3)。  FIG. 8 is a top view of the inside of the deposition chamber (Example 3). 图9是成膜室内部的顶视图（实施例3)。  FIG. 9 is a top view of the inside of the deposition chamber (Example 3). 图10是表不本发明容器的图（实施方案4)。  FIG. FIG. 10 is a table (Embodiment 4) of the present invention is not the container. 图11是表示本发明蒸镀装置的图（实施方案4)。  FIG 11 shows (Embodiment 4) of the vapor deposition apparatus of the present invention. 图12是表示有源矩阵型EL显示装置的结构的图。  FIG. 12 is a diagram showing a configuration of an active matrix type EL display. 图13是表示一些电器实例的图。  FIG. 13 shows an example of some of the appliance of FIG. 图14是实施例6所示的电器的方框图。  FIG. 14 is a block diagram of the electrical shown in Example 6. 图15是控制方框图。  FIG. 15 is a control block diagram. 针对本发明的实施方案，以下进行说明。  For embodiments of the present invention will be described below. 图1 (A)是本发明掩模的斜视图。  FIG 1 (A) is a perspective view of the mask of the present invention. 将掩模本体122固定在固定位置A124a处，该位置是设置在通过掩模框架120的热膨胀中121的线上的。 The mask body 122 in a fixed position at A124a, the location is provided by thermal expansion of the mask frame 120 in line 121. 还有，优选使在蒸镀室内承载掩模框架的臂（图中未表示）也承载在该固定位置A124a处。 It is preferable that the arm carrier vapor deposition chamber in the mask frame (not shown) that is also carried in a fixed position at A124a. 还有，图1 (B)是蒸镀时承载基板124时的截面视图。  Further, FIG. 1 (B) is a cross-sectional view of a carrier of the substrate 124 during deposition. 蒸镀时，基板124与掩模本体122和掩模框架120按照一定的位置进行对准，通过基板背面上设置的磁铁（图中未表示） 利用磁力使掩模本体与基板的蒸镀面完全贴紧。 When the vapor deposition, the substrate 124 and the mask body 122 and the mask frame 120 is aligned in a certain position by a magnet provided on the back surface of the substrate (not shown) with a magnetic surface of the vapor deposition mask and the substrate main body is completely snapping. 这里虽然以通过磁铁固定的情况为例，但也可以通过机械方式固定。 Although in the case of fixed magnets, for example, but may be fixed by mechanical means. 而且，在掩模本体上预先设置开口部分123,蒸镀材料穿过开口部分123而成膜，就能够在基板124上形成图案。 Further, the body is set in advance on the mask opening portion 123, passes through the deposition material 123 forming the opening portion, a pattern can be formed on the substrate 124. 还有，就本发明而言，将基板124和掩模本体122固定，通过使蒸镀源沿X方向或Y方向移动来进行蒸镀。  Further, the purposes of the present invention, the substrate 124 and the mask body 122 is fixed, the deposition is performed by vapor deposition source is moved in the X or Y direction. 这种使蒸镀源沿X方向或Y方向移动的方法适合于大型基板的蒸镀。 Such vapor deposition source is moved in the X or Y direction of the vapor deposition method is suitable for large substrates. 就本发明而言，优选采用使用了具有与基板相同的热膨胀系数的材料的掩模本体。  For the present invention, preferable to use a mask and the substrate body having the same coefficient of thermal expansion of the material. 比如，在使用玻璃基板时，就掩模本体而言，可以使用与玻璃热膨胀率相近的42合金(Fe-Ni合金：Ni 42% )或36殷钢（Fe-Ni合金：Ni 36% )。 For example, when a glass substrate, the mask on the body, the alloy 42 can be used (Fe-Ni alloys: Ni 42%) and the coefficient of thermal expansion similar to the glass 36 or Invar (Fe-Ni alloys: Ni 36%). 在蒸镀时，虽然进行加热，但掩模本体和基板的膨胀量相同，因此也不容易产生位置偏差。 During vapor deposition, while heated, but the same amount of expansion of the mask body and the substrate, and therefore positional deviation is not easily generated. 还有，掩模框架120虽然也被加热，但因为热膨胀中心的位置不会发生变化，所以即使掩模框架120与掩模本体122的材料不同而使其热膨胀系数不同的话，也不容易产生位置偏差。 Also, although the mask frame 120 is also heated, but since the center position of the thermal expansion does not change, even if the different materials of the mask frame and the mask 120 and the body 122 of a different coefficient of thermal expansion, it is not easy to generate a position deviation. 本发明特别适于因为加热而容易产生大的位置偏差的大型基板的蒸镀。 The present invention is particularly suitable for large-scale deposition substrate because of a large heat easily positional deviation. 还有，掩模可以通过蚀刻法或电铸法形成。  Further, a mask may be formed by etching or electroforming. 还有，也可以将干蚀刻法或湿蚀刻法等蚀刻法与在与蒸镀掩模相同的金属的电铸液槽中进行的电铸法组合在一起而形成掩模。 There may be a dry etching method or wet etching method and an etching method for electrically in the same vapor deposition mask electroforming tank in metal casting method to form a combined mask. 还有，为了在加热状态下保持掩模本体122的张力，如果不采用固定位置A124a， 而是在与热膨胀中心相比更靠外周侧的固定位置B124b上固定的话，就能够利用掩模框架的膨胀量来保持掩模本体122的张力。  Further, in order to maintain the tension of mask body 122 in a heated state, if the position A 124a is not fixed, but a more permanent fixing position on the outer peripheral side B124b compared to thermal expansion of the center, then it is possible to use a mask the amount of expansion of the mold frame to maintain the tension of the mask body 122. 从热膨胀中心至固定位置B124b的距离是由蒸镀时的加热温度、框架热膨胀系数、框架外周和内周共同适当确定的。 The distance from the center to the thermal expansion of the fixing position B124b is determined by the heating temperature during the deposition, the thermal expansion coefficient of the frame, and the inner periphery of the outer peripheral frame together appropriately determined. 还有，图1(C)是使掩模框架的四角圆滑的实例。  Further, FIG. 1 (C) is to smooth the corners of the mask frame instance. 通过使掩模的四角圆滑，就会防止掩模框架的角因任何碰撞而遭到损坏。 By rounded corners of the mask, the mask frame will be prevented for any angle of collision damaged. 而且，在图1(C)中，130是掩模框架，131是热膨胀中心，132是掩模本体，133是开口部分。 Further, in FIG. 1 (C), 130 is a mask frame, 131 is the center of the thermal expansion, the mask body 132, an opening 133 is a part. 还有，图4是设置了间隙部分223b的实例，它在开口部分223a的四角上保留了余量。  Further, FIG. 4 is an example of a gap portion 223b is provided, which is retained in the opening portion 223a of the four corners of the margin. 通过设置间隙部分223b，即使对掩模本体232施加张力，即使发生热膨胀，也能够防止裂纹从相邻开口部分的角处进入掩模本体232中。 By providing the gap section 223b, even when tension is applied to the mask body 232, even if thermal expansion occurs, it is possible to prevent cracks from adjacent corner portions of the mask body 232 into the opening. 而且，在图4中，230是掩模框架，231是热膨胀中心，232是掩模本体，224是固定位置。 Further, in FIG. 4, the mask frame is 230, 231 is a thermal expansion of the center, the body 232 is a mask, 224 is a fixed position. 在这里，就基板支持装置的结构利用图2进行详细的说明。  Here, the support structure on the substrate using the apparatus of FIG. 2 will be described in detail. 使用大面积基板来制取多个面（1个基板上形成多个图案）时，按照划线部分接触的那样设置了支持基板用的基板支持装置。 When using a large area substrate for preparing a plurality of surfaces (a plurality of patterns are formed on one substrate), it is provided as part of the scribe line according to the substrate supporting means for a substrate contact. 即，基板支持装置上承载着基板，从在基板支持装置下方设置的蒸镀源托座使蒸镀材料升华，利用基板支持装置对未接触的区域进行蒸镀。 That is, the substrate on the substrate carrying the support means from the evaporation source holder disposed below the substrate support apparatus of sublimation vapor deposition material, a region not in contact with the vapor deposition apparatus by the substrate support. 如此而为，就能够将大面积基板的弯曲变形抑制在1mm或更小。 And thus, for a bending deformation on a large area substrate can be suppressed to 1mm or less. 就图2 (A)而目，表不的是承载了基板303和掩|旲302的基板支持装置301的斜视图，图2 (B)仅表示了基板支持装置301。  respect to Figure 2 (A) and head, the table is not carrying the substrate 303 and mask | perspective view of the substrate supporting device 301 of FIG Dae 302, FIG. 2 (B) shows only the substrate support apparatus 301. 还有，图2(C)表示的是掩模302上承载着基板303的基板支持装置的截面视图， 它是由高h为10mm~50mm、宽w是1mm~5mm的金属板（典型的是Ti和形状记忆合金等） 构成的。  In addition, FIG. 2 (C) is represented by a cross-sectional view of a substrate carrying a substrate supporting device 303 in the mask 302, it is the height h of 10mm ~ 50mm, a width w of 1mm ~ 5mm sheet metal ( typically composed of Ti shape memory alloys and the like). 还有，基板支持装置也可以是由形状记忆合金构成的金属丝。 Further, the substrate support means may be a wire made of a shape memory alloy. 基板支持装置是通过焊接或粘结法与掩模302固定的。 Substrate supporting means is fixed by welding or bonding process with the mask 302. 还有，掩模302是通过粘合剂固定在掩模框架304的热膨胀中心位置上的。 Also, the mask 302 is fixed by an adhesive in the thermal expansion of the center position of the mask 304 on the frame. 通过该基板支持装置301，就能够抑制基板弯曲或因基板重量而产生的掩模弯曲现象。  By means of the supporting substrate 301, it is possible to suppress the bending of the substrate due to weight of the substrate or a mask generated bending phenomenon. 还有，通过该基板支持装置301，在抑制掩模弯曲现象的同时，还能够保持掩模的张力。 Further, the support means 301 through the substrate, while suppressing the bowing phenomenon of the mask, but also to maintain the tension mask. 还有，基板支持装置301的形状并不限于图2(A)~图2(C)，只要是与掩模上设置的掩模开口部分不重合的形状即可。  Further, the shape of the substrate support apparatus 301 is not limited to FIG. 2 (A) ~ FIG. 2 (C), as long as the opening portion of the mask is provided on the mask does not overlap a shape. 本实施方案可以与实施方案1自由组合。  The present embodiment can be freely combined with embodiment 1. 在这里，表示的是通过蒸镀法进行RGB分色涂布的实例。  Here, for example RGB represents the dichroic coating by vapor deposition. 就图3(A)而言，它表不的是由掩模框架420和掩模本体422构成的掩模的分解斜视图。 For  respect to Figure 3 (A), which is an exploded perspective view of the table is not a mask made of a mask and the mask frame 420 of the body 422. 掩模框架420的热膨胀中心421与它和掩模本体422的粘结部位426重合。  The thermal expansion of the mask frame 421 and the center bond portion 420 and the mask body 422 which coincides 426. 还有， 在掩模本体上设置了开口部分423。 Further, the body is provided on the mask opening portion 423. 该开口部分423是按照RGB中的1种图案设置的。 The opening portion 423 is in RGB one kind of pattern is provided. 这里为了简化，表示的是具有9行X 15列开口部分的掩模，但并不是说特别限定于此，所需的象素数目可以根据情况适当确定，比如VGA级别的象素数目为640 X 480个，而XGA级别是1024X768 个。 Here for simplicity, represented by the mask 15 is an opening portion 9 having a line X, but not particularly limited to say, the required number of pixels may be determined appropriately according to the situation, such as the number of pixels for VGA level 640 X 480, while the XGA 1024X768 level is one. 为了进行RGB分色涂布，提供了3个掩模。  For color separation of RGB is applied, a three masks. 提供3个掩模时，掩模本体可以遵从同一掩模设计，但是在将其固定在掩模框架上时，要按照规定的象素位置分别进行粘结。 Providing three mask, the mask body may be designed to comply with the same mask, but the mask is on the frame, which is fixed to be bonded in accordance with a predetermined pixel position, respectively. 或者，在采用1个掩模的情况下，在对准时针对每一个RGB使掩模相对于基板错开一些而进行蒸镀也是可以的。 Alternatively, in the case of a mask, the alignment of the mask for each of RGB is shifted relative to the substrate and some of the vapor deposition are also possible. 还有，在1个室内采用1个掩模时，在对准时针对每一个RGB使掩模相对于基板错开一些而进行蒸镀也是可以的。 Further, when using a mask in a chamber, in which the mask alignment for each of RGB is shifted relative to the substrate and some of the vapor deposition are also possible. 图3 (B)表不的是进行完RGB 3种蒸锻之后基板的斜视图。  FIG. 3 (B) is a perspective view of the table is not carried out after the completion of forging RGB 3 Species distilled substrate. 在基板430上有规律地蒸镀了红色用蒸镀膜431、绿色用蒸镀膜432、蓝色用蒸镀膜433。 On the substrate 430 regularly vapor deposited film of the red 431, green 432 with the deposited film, evaporated film 433 for blue. 总计形成405(27行X 15 列）个图案。 Total 405 is formed (27 rows X 15 columns) patterns. 本实施方案也可以与实施方案1和实施方案2自由组合。  2 of the present embodiment may be freely combined with embodiment 1 and embodiments. 在这里，以图10表示贮存蒸镀材料用的容器。  Here, FIG 10 shows a storage container to a vapor deposition material is used. 图10(A)是容器的斜视图，图10(B) 是沿点划线AB剖开的截面视图，图10(C)是沿点线CD线剖开的截面视图。 FIG 10 (A) is a perspective view of the container, FIG. 10 (B) is a sectional view taken along the dot-dash line AB, FIG. 10 (C) is a sectional view taken along the dotted line CD. 在改变蒸镀源的安装角度时，使圆筒形坩埚和包围它的加热器也发生倾斜，所以在使用2个坩埚进行共蒸镀时，它们之间的间隔就会变大。  When changing the installation angle of the vapor deposition source, a crucible and the cylindrical heater surrounding it occurs is also inclined, so when using two co-evaporation crucible, the spacing between them becomes large. 间隔大的话，将2种不同的蒸镀材料均匀地混合在一起就很难了。 Interval large, uniformly mixing two different materials together, it is very difficult deposition. 还有，蒸镀源和基板之间的间隔变窄而欲进行蒸镀时，很难获得均一的膜。 Further, the spacing between the substrate and the evaporation source for deposition and wish narrows, it is difficult to obtain a uniform film. 在这里，本发明并不改变蒸镀源的安装角度，而是通过容器上部分800a的开口810来调节蒸镀中心。  Here, the present invention does not change the mounting angle of the vapor deposition source, the vapor deposition is adjusted but the central opening 810 through the upper portion 800a of the container. 该容器是由容器上部分800a和容器下部分800b以及中盖800c构成的。 The container is a container portion 800a and a lower container portion 800b and 800c are formed of the cap. 而且，中盖800c上设有多个小孔，蒸镀时蒸镀材料从这些孔中通过。 Further, a plurality of small holes in the cap 800c, the deposition material through the holes during the deposition. 还有，该容器是由BN烧结体、BN和A1N的复合烧结体、石英或石墨等材料形成的，因此能够耐高温、高压、 减压。 Further, the container is formed of a sintered body of BN, A1N and BN composite sintered body, graphite, quartz or the like material, can be high temperature, high pressure, under reduced pressure. 根据蒸镀材料的不同，蒸镀方向和扩散面等方面也是不同的，因此适当提供了针对各种蒸镀材料能够调节开口810的面积、开口导引部分和开口位置的容器。 According to the different aspect, and the diffusion surface, such deposition direction of the vapor deposition material is different, and therefore appropriate to provide a vapor deposition material can be adjusted for various areas of the openings 810, the guide portion and the opening position of the container opening. 采用本发明的容器时，无须倾斜蒸镀源加热器就能够调节蒸镀中心。  When using the container according to the present invention, the heater without the oblique deposition source can be adjusted to the center of the vapor deposition. 还有，如图10 (D)所示，在共蒸镀过程中，使开口810a和开口810b二者面对面设置，缩小了贮存着多种不同的蒸镀材料（材料A805、材料B806)的多个容器彼此之间的间隔，能够在实现均一混合的同时进行蒸镀。 Further, FIG. 10 (D), in the co-evaporation process, so that both the opening 810a and the opening 810b disposed face to face, with reduced storage of a plurality of different vapor deposition materials (Materials A805, B806 material) more the spacing between the containers to each other, can be deposited while achieving uniform mixing. 在图10(D)中，加热装置801-804连接在各自的电源上，因此可以相互独立地调节温度。 In FIG. 10 (D), 801-804 heating means connected to a respective power source, it is possible to independently regulate the temperature. 还有，蒸镀源和基板的间隔缩小为比如最多20cm，在需要进行蒸镀时，也能够获得均一的膜。 Further, the vapor deposition source and the substrate spacing is reduced to such a maximum of 20cm, when the vapor deposition is required, it is possible to obtain a uniform film. 还有，图10(E)表示的是与图10⑶不同的实例。 Represented by  Further, FIG. 10 (E) are different from the example of FIG 10⑶. 在图10(E)中，该实例使用了使开口810c按垂直方向蒸镀的上部分，而且使用了具有沿该方向倾斜的开口810d的上部分来进行蒸镀。 In FIG. 10 (E), this example uses the upper portion of the opening evaporated vertical direction 810c, and the use of the upper portion having an opening 810d in the oblique direction is used for the evaporation. 在图10(E)中，加热装置801、803、807、808也与其各自的电源连接，因此可以相互独立地调节温度。 In FIG. 10 (E), heating means 801,803,807,808 also connected to their respective power source, it is possible to independently regulate the temperature. 还有，图10所示的本发明容器，其开口是细长的，所以就能扩大均匀蒸镀的区域， 即使在固定着大面积基板的情况下也适于均匀的蒸镀。  Further, the present invention is shown in FIG. 10 the container, which opening is elongate, so that a uniform deposition can be enlarged region, also suitable for a uniform deposition even when a large area substrate is fixed. 图11表示的是成膜装置的顶视图，该成膜装置使用了本文图10所示的容器，并且在固定着大面积基板的情况下进行蒸镀。  FIG. 11 is a top view showing a film forming apparatus, a film forming apparatus using the container shown in FIG. 10 herein, and in the case where the fixed substrate was deposited a large area. 基板815从运送室813通过开合门814而运送进入成膜室812。  The substrate 815 from the transfer chamber 813 by opening and closing the door 814 and conveyed into the film forming chamber 812. 根据需要，在运送室813或成膜室812中对基板和掩模（图中未表示）的位置进行对合。 Necessary, be bonded to the substrate and the position of the mask (not shown) in transfer chamber 813 or the film-forming chamber 812. 将由具有开口810的容器上部分800a和容器下部分800b构成的容器800设置在蒸镀源托座811上。  by evaporation source holder having a container 800 is provided 811 and a lower portion 800a of the container 810 on the container opening portion 800b in the configuration. 蒸镀源托座811利用在成膜室812内沿X方向、Y方向、或Z方向移动的移动装置（图中未表示）而在基板815下方移动。 Evaporation source holder 811 is moved using the mobile device in the film forming chamber 812 in the X direction, Y direction, or Z direction (not shown) is moved below the substrate 815. 图11中的点划线是蒸镀源托座的一种移动线路。 Dot chain line in FIG. 11 is a moving line of the evaporation source holder. 而且，在图11所示的蒸镀装置中，蒸镀时，因为缩小了基板813和蒸镀源托座811 之间的间隔距离d，典型的是30cm或更小，优选20cm或更小，更优选5cm~15cm，因此可以显著提高蒸镀材料的使用效率。  Further, in the vapor deposition device shown in FIG. 11, during the deposition, because the reduced separation distance d between the substrate 813 and the evaporation source holder 811, typically 30cm or less, preferably 20cm or less, more preferably 5cm ~ 15cm, it is possible to significantly improve the efficiency of the vapor deposition material. 还有，因为缩小了基板813和蒸镀源托座811之间的间隔距离d，典型的是30cm或更小，优选5cm~15cm，所以也存在着使蒸镀掩模（图中未表示）受热的可能。  Further, since the reduced spacing distance d between the substrate 813 and the evaporation source holder 811, typically 30cm or less, preferably 5cm ~ 15cm, so there are the vapor deposition mask (FIG. not shown) may be heated. 因此，希望蒸镀掩模14使用受热而不易变形的热膨胀率低的金属材料（比如钨、钽、铬、镍或钥高熔点金属或含有这些元素的合金、不锈钢、因科镍合金、耐盐酸镍基合金材料）。 Accordingly, it is desirable to use vapor deposition mask 14 is heated and deformed easily with low coefficient of thermal expansion of a metal material (such as tungsten, tantalum, chromium, nickel, or refractory metals or containing these key elements in the alloy, stainless steel, Inconel, acid-resistant nickel-based alloy). 比如，可以提及含镍42%、铁58%的低热膨胀合金等。 For example, mention may be made of 42% nickel, 58% iron alloy of low thermal expansion. 还有，为了冷却受热的蒸镀掩模，也可以具备为蒸镀掩模提供冷却介质（冷却水、冷却气）循环的装置。 Further, in order to cool the heated deposition mask, it may be provided to provide means for circulating a cooling medium (cooling water, cooling gas) to the evaporation mask. 而且，本实施方案可以与实施方案1-3中任何的一个自由组合。  Further, the present embodiment can be freely combined with any one of embodiments 1-3. 图5表示的是多室型制造装置的顶视图。  FIG. 5 shows a top view of a multi-chamber manufacturing apparatus. 图5所示的制造装置中设置了可提高功效的室。 Manufacturing apparatus shown in FIG. 5 may be provided to improve the effectiveness of the chamber. 在图5所示的制造装置中，至少在运送室504a、504b、508、514中经常保持真空，而且成膜室506W1、506W2、506W3中也要经常真空保持。  In the manufacturing apparatus shown in FIG. 5, at least in the transport chamber 504a, 504b, 508,514 often maintain a vacuum, and the deposition chamber should be kept 506W1,506W2,506W3 in vacuo. 因此，就能够省略成膜室内的真空排气操作以及成膜室内的氮气充填操作，从而在短时间内就能够进行连续的成膜处理。 Accordingly, it is possible to omit the deposition chamber and the evacuation operation of the deposition chamber is filled with nitrogen gas operation, so that a continuous film formation can be performed in a short time. 在1个成膜室中，在由不同的材料层层合而成的EL层（含有空穴传输层、空穴注入层、发光层、电子传输层、电子注入层等）中，仅对1个层进行成膜。  In a deposition chamber, the bonded layers of different materials formed by the EL layer (containing a hole transport layer, a hole injection layer, a light emitting layer, electron transport layer, an electron injection layer, etc. ), forming only one layer. 在各个成膜室中设置了可在成膜室内移动的蒸镀源托座。 It is provided in the film forming chamber movable evaporation source holder in each film forming chamber. 按照以下方式设置成膜室：提供多个该蒸镀源托座，适当地提供多个封入有EL材料的容器（坩埚）。 The film forming chamber is provided as follows: providing a plurality of the evaporation source holder, the container is suitably provided with a plurality of enclosed EL material (crucible). 以面朝下的方式设置基板，利用CCD等对蒸镀掩模的位置进行对准，通过电阻加热法进行蒸镀，由此就可以选择性地进行成膜。 Face-down substrate is provided, with a CCD or the like on the evaporation mask alignment position, by resistance heating vapor deposition method, whereby the deposition can be carried out selectively. 封入有EL材料的容器（坩埚）的安装以及蒸镀托座部件的交换等是在设置室526口、5269、5261'、5268中进行的。  The EL material is sealed vessel (crucible) and the exchange of the mounting bracket member deposition or the like is disposed in the chamber 526, 5269,5261 ', 5268 are performed. 在原材料制造商处将£1材料贮存在容器（典型地是坩埚）中。 In the material manufacturer. 1 £ material is stored in a container (typically a crucible) in. 而且，在安装时优选不接触大气，从材料制造商处运送来的时候，坩埚是在第二容器中密封的情况下引入设置室内的。 Further, when the installation is preferably not in contact with the atmosphere, when conveyed from the material manufacturer, the crucible is introduced into the chamber in a second container disposed in the sealed case. 使设置室形成真空，在设置室内将坩埚从第二容器中取出来，将坩埚安装在蒸镀托座上。 Provided that the formation of a vacuum chamber, the chamber is provided from the second container to take the crucible out, the crucible is mounted in the seat bracket vapor deposition. 这样就能够防止坩埚和该坩埚贮存的EL材料受到污染。 Thus it is possible to prevent the crucible and the crucible reservoir EL material contamination. 在本发明中，为了获得封入有由含有有机化合物的层而形成的3层结构的白色发光元件，在最低限度下采用3个室结构就可以形成含有机化合物的层。  In the present invention, in order to obtain a white light emitting layer 3 is sealed by an element structure of a layer containing an organic compound formed using three-chamber structure at a minimum and form a layer containing an organic compound. 因为采用了3个室， 所以能够缩短工艺时间，还能够降低制造装置的成本。 Because the use of three chambers, it is possible to shorten the process time, but also reduce the cost of manufacturing the device. 还有，各层的厚度也可以很薄，为20nm~40nm，这对材料成本而言是有利的。 Further, the thickness of each layer may be very thin as 20nm ~ 40nm, which is advantageous in terms of material cost. 比如，在形成白色发光元件时，适宜的是在成膜室506W1中使作为第一发光层的空穴传输层（HTL)成膜，在成膜室506W2中使第二发光层成膜，在成膜室506W3内使电子传输层（ETL)成膜，然后在成膜室510内形成阴极。  For example, when a white light emitting element, the film forming chamber is suitable as a hole transporting layer 506W1 manipulation of the first light emitting layer (HTL) deposition, in the deposition chamber to a second light emitting layer manipulation 506W2 film so that the film-forming chamber 506W3 electron transport layer (ETL) deposition, and then forming the cathode in the deposition chamber 510. 就第一发光层的发光体而言，可以使用TPD、a -NH)等具有空穴传输性能的蓝色荧光材料。 To the first light emitting phosphor layer, use may TPD, a -NH) like a blue fluorescent material having a hole transporting property. 还有，就第二发光层的发光体而言，以钼为中心金属的金属有机络合物是有效的。 Further, the material of the second emitting layer emits light in terms of molybdenum metal as a central metal organic complex is effective. 具体而言，向主体材料中以高浓度（10重量％~ 40重量％，优选12. 5重量％~20重量％ )混入下述结构式（1)~（4)所示的物质的话，就能够产生磷光发光和激基复合物发光两种现象。 Specifically, the host material to the material at a high concentration (10 wt% to 40 wt%, preferably 12.5 wt% to 20 wt%) were mixed by the following structural formula (1) to (4), then, can be and generating a phosphorescent light emitting exciplex two phenomena. 但本发明并不限定于此，可以采用任何一种同时产生磷光发光和激基复合物发光两种现象的磷光材料。 However, the present invention is not limited thereto, any method of simultaneously generating a phosphorescent material and a phosphorescent light emitting exciplex two phenomena. 还有，就能够用于电子传输层（ETL)的电子传输材料而言，可以提及三（8-喹啉醇合）铝（简称：Alq 3)、三（4-甲基-8-喹啉醇合）铝（简称：Almq3)、双（10-羟基苯并[h]_喹啉醇合）铍（简称：BeBq 2)、双（2-甲基-8-喹啉醇合）_(4_羟基-联苯基）_铝(简称：BAlq)、双[2-(2-羟基苯基）苯并嗝唑合]锌（简称：Zn (BOX) 2)、双[2-(2-羟基苯基）-苯并噻唑合]锌（简称：Zn(BTZ)2)等金属络合物。  In addition, in terms of the electron transporting material can be used for the electron transport layer (ETL) can be mentioned tris (8-quinolinolato) aluminum (abbreviation: Alq 3), tris (4-methyl - 8-quinolinolato) aluminum (abbreviation: Almq3), bis (10-hydroxybenzo [H] _ quinolinolato) beryllium (abbreviation: BeBq 2), bis (2-methyl-8-quinolinolato co) _ (4_ hydroxy - biphenylyl) _ aluminum (abbreviation: BAlq), bis [2- (2-hydroxyphenyl) benzo belch yl] zinc (abbreviation: Zn (BOX) 2), bis [ 2- (2-hydroxyphenyl) - benzothiazolato] zinc (abbreviation: Zn (BTZ) 2) and other metal complexes. 而且，除了金属络合物以外，可以米用2- (4-联苯基）_5_ (4-叔丁基苯基）-1，3,4- 11恶二唑（简称：PBD)、1，3-双[5-(对叔丁基苯基）-1，3,4_喝二唑-2-基]苯（简称：0XD-7)等嗝二唑衍生物、3-(4_叔丁基苯基）-4-苯基-5- (4-联苯基）-1，2，4-三唑（简称：TAZ)、3- (4-叔丁基苯基）-4- (4-乙基苯基）-5_(4_联苯基）-1，2,4_三唑（简称：p-EtTAZ)等三唑衍生物、2,2'，2" _(1，3,5_苯三基）三[1-苯基-1H-苯并咪唑](简称：TPBI)等咪唑衍生物、红菲绕啉（简称：BPhen)、 浴铜灵（简称：BCP)等菲绕啉衍生物。 Further, in addition to the metal complexes, m can be 2- (4-biphenyl) _5_ (4-tert-butylphenyl) -1,3,4-oxadiazole 11 (abbreviation: PBD), 1, 3-bis [5- (p-tert-butylphenyl) -1,3,4_ drink oxadiazol-2-yl] benzene (abbreviation: 0XD-7) like belch oxadiazole derivative, 3- (4 _ t butylphenyl) -4-phenyl-5- (4-biphenylyl) -1,2,4-triazole (abbreviation: TAZ), 3- (4- tert-butylphenyl) -4- ( 4-ethylphenyl) -5_ (4_ biphenylyl) -1,2,4_ triazole (abbreviation: p-EtTAZ) and the like triazole derivatives, 2,2 ', 2 "_ (1,3 , 5_ phenyl) tris [1-phenyl-benzimidazole -1H-] (abbreviation: TPBI) imidazole derivatives and the like, bathophenanthroline (abbreviation: BPhen), bathocuproine (abbreviation: BCP) phenanthrene about derivatives. 特别地，通过共蒸镀能够向第二发光层中以高的浓度（10重量％~40重量％，优选12. 5重量％~20重量％ )混入一种金属络合物，所以浓度调节变得很容易，适合于大量生产。  In particular, by co-evaporation can be the second light emitting layer at high concentration (10 wt% to 40 wt%, preferably 12.5 wt% to 20 wt%) mixed with one metal complex, so adjusting the concentration becomes easy, suitable for mass production. 即，该蒸镀掩模可以使用简单型掩模，该掩模是在引出电极（取>9出U電極）露出部位（随后与FPC贴合的部位）以外的区域内进行蒸镀的。  That is, the deposition mask can simply type mask, the mask is in the lead-out electrode (taken> 9 U electrode) exposed section (the FPC is then bonded portion) in the region other than the deposition of. 还有，为了形成两面发光式面板，将阴极制成薄金属膜与透明导电膜的叠层。  Further, in order to form both surfaces of the light emitting panel, the cathode is made of laminated thin metal film and the transparent conductive film. 可以通过电阻加热法将薄金属膜（Ag或MgAg)制成lnm~10nm的膜厚,透明导电膜是通过溉镀法形成的，因此短时间内就可以形成阴极。 May be a thin metal film (Ag or MgAg) formed by a resistance heating method to a thickness of lnm ~ 10nm, the transparent conductive film is formed by plating irrigation method, it can be formed in a short time and therefore the cathode. 这里表示的是白色发光面板的制造实例，但是制造其它单色发光（绿色、红色、蓝色等）面板也是可以的。  where represents the example of the manufacture of white light-emitting panel, but the other producing monochromatic light (green, red, blue, etc.) panels are also possible. 以下对向图5所示的制造装置中运送预先设置了阳极（第一电极）和覆盖该阳极端部的绝缘物（隔片）的基板，以制造发光装置的步骤进行说明。  Hereinafter, the conveying apparatus shown in Fig manufactured in advance is provided an anode (first electrode) and the insulation cover of the male terminal portion (separator) substrate, a step of manufacturing the light emitting device will be described. 而且，在制造有源矩阵型发光装置时，预先在基板上设置了与阳极相连的多个薄膜晶体管（电流调节用TFT)和多个其它薄膜晶体管（开关用TFT等），还设置了具有薄膜晶体管的驱动电路。 Further, at the time of manufacturing an active matrix light-emitting device, it is provided in advance on the substrate a plurality of thin film transistors connected to the anode (the current regulating a TFT) and a plurality of other thin film transistors (switching TFT and the like), further provided with a thin film driving transistor. 还有，在制造简单矩阵型发光装置时，也可以采用图5所示的制造装置进行制造。 Further, in the production of simple matrix type light emitting device, the device may be manufactured as shown in FIG. 5 manufactured employed. 首先，将前述基板（600mmX720mm)固定在基板载入室520中。  First, the substrate (600mmX720mm) fixed to the substrate loading chamber 520. 即使是基板尺寸为320mmX400mm、370mmX470mm、550mmX650mm、600mmX720mm、680mmX880mm、 1000_X 1200mm、1100_X 1250mm以及1150_X 1300mm的大面积基板，也能够应对。 Even the size of the substrate 320mmX400mm, 370mmX470mm, 550mmX650mm, 600mmX720mm, 680mmX880mm, 1200mm, 1100_X 1250mm and a large area substrate 1150_X 1300mm 1000_X, can be dealt with. 将设置在基板载入室520中的基板（设置了阳极和覆盖该阳极端部的绝缘物的基板）运送至保持大气压的运送室518中。  The substrate loading chamber disposed in the substrate 520 (the substrate provided with the anode and the insulating material covering the male terminal portion) is conveyed to the atmospheric pressure is maintained in the transfer chamber 518. 而且，在运送室518中设置了用于运送或反转基板的运送装置（运送机械手等）。 Furthermore, conveying means are provided for conveying the substrate or inverting (transport robot or the like) in the transport chamber 518. 还有，在运送室508、514、502中分别设置了运送装置和真空排气装置。  Further, in the transport chamber 508,514,502 are respectively provided with transport means and vacuum exhaust means. 在运送室518中设置的机械手能够将基板的正反面反转，还能将其反转着运送到运送接收室505中。 In the transport chamber 518 provided in the robot can be reversed front and back surfaces of the substrate, which can be transported to the transport reversing the receiving chamber 505. 运送接收室505与真空排气处理室相连，它能够通过真空排气而产生真空，还能够在真空排气之后，通过引入非活性气体而达到大气压。 Receiving transport chamber 505 is connected to the vacuum exhaust treatment chamber, it is possible to generate a vacuum by the vacuum evacuation, it is possible, after evacuation, by introducing an inert gas to atmospheric pressure. 还有，就前述的真空排气处理室而言，具备磁悬浮型涡轮分子泵、低温泵或干泵。  In addition, in terms of the vacuum evacuation processing chamber, comprising magnetic levitation type turbo molecular pump, a cryopump or a dry pump. 通过这些装置，能够使与各室相连的运送室的真空度达到1〇_ 5~10 _6Pa，而且可以控制从泵一侧和排气系统而来的杂质的反向扩散。 By these means, the degree of vacuum conveying chamber can be connected with each chamber reaches 1〇_ 5 ~ 10 _6Pa, and the back diffusion can be controlled from one side of the pump from the exhaust system and the impurities. 为了防止向装置内部引入杂质，就引入气体而言， 采用的是氮气和稀有气体等非活性气体。 In order to prevent the introduction of impurities into the inside of the apparatus, on the introduction of gas, the use of nitrogen and the noble gas or the like inert gas. 向装置内部引入的这些气体，使用的是在向装置中引入之前经过气体精制机高度提纯过的气体。 These gases introduced to the inside of apparatus is used prior to introduction into the device through the gas refiner height of the purified gas. 因此，为了使气体在经过高度提纯之后才引入蒸镀装置之中，必须提供气体精制机。 Accordingly, in order to make the gas introduction into the deposition apparatus only after a highly purified, it must provide a gas refiner. 如此一来，就能够除去气体中所含的氧、水和其它杂质等，也能够防止向装置内部引入这些杂质。 Thus, it is possible to remove oxygen, water and other impurities contained in the gas, and the like, it is possible to prevent the introduction of these impurities into the inside of the apparatus. 还有，在向基板装载室520中设置之前，为了减少点缺陷，采用含有表面活性剂(弱碱性）的多孔性海绵材料（典型的是PVA(聚乙烯醇）制、尼龙制海绵等）对第一电极(阳极）的表面进行清洁，优选除去表面碎屑。  Further, in the substrate prior to the loading chamber 520 is provided, in order to reduce point defects, porous sponge material containing a surfactant (weak alkaline) (typically a PVA (polyvinyl alcohol), nylon, sponges, etc) for cleaning the surface of the first electrode (anode), it is preferable to remove surface debris. 就清洁设备而言，可以使用具有围绕着与基板面平行的轴线旋转并与基板面接触的滚刷（PVA制）的洗净装置，也可以使用具有围绕与基板面垂直的轴线旋转同时与基板面接触的圆盘刷（PVA制）的洗净装置。 In terms of cleaning apparatus, the roll brush having a cleaning device may be used around an axis of rotation parallel to the substrate surface and in contact with the substrate surface (PVA, Ltd.), may also be used with about an axis perpendicular to the substrate surface while rotating the substrate the disk surface contact brush (PVA) was washing apparatus. 然后，将基板由运送室518向运送接收室505中运送，而且，在不接触大气的情况下，将基板从运送接收室505运送至运送室502中。  Then, the substrate 518 transported by the transport chamber to transport the receiving chamber 505, and, without contacting the atmosphere, the substrate is transported to the transport chamber 502 from chamber 505 receives transport. 还有，为了消除收缩现象，在即将进行含有有机化合物的膜的蒸镀之前优选真空加热，将基板从运送室502向多级真空加热室521中运送，为了彻底地除去前述基板中所含的水分和其它气体等，在真空（5Xl(T 3Torr(0. 665Pa)或以下，优选1(T4~l(T6Pa)下缓慢冷却以实现脱气。多级真空加热室512中使用了平板加热器（典型地是夹套加热器），将多个基板均匀地加热。通过提供多个这种平板加热器，用平板加热器将基板夹在中间，由此能够从两面进行加热，不用说，从单面加热也是可以的。特别地，采用有机树脂膜作为层间绝缘膜和隔片材料时，就有机树脂材料而言，它容易吸附水分，有可能会进一步产生脱气现象，所以在形成含有机化合物的层之前，在l〇〇°C~250°C，优选150°C~200°C下比如至少加热30分钟，然后自然冷却30分钟，由此进行真空加热以除去吸附  Further, in order to eliminate shrinkage, the upcoming film containing an organic compound is preferably deposited prior to vacuum heating, the substrate is transported from the transport chamber 502 to the multi-stage vacuum heating chamber 521, in order to completely remove the substrate It contained moisture and other gases, in vacuo (5Xl (T 3Torr (0. 665Pa) or less, preferably 1 (T4 ~ l (T6Pa) was slowly cooled to effect deaeration multistage vacuum heating chamber 512 using panel heater (typically a jacket heater), a plurality of substrates uniformly heated. by providing such a plurality of heater plates, with a plate heater substrate sandwiched thereby can be heated from both sides, without He said heating from one side is also possible. in particular, as the organic resin film when the interlayer insulating film and the separator material, in terms of the organic resin material, it is readily absorbs moisture, it is possible to further degassing phenomenon is generated, so before forming layers containing organic compounds, such as heated at l〇〇 ° C ~ 250 ° C, preferably 150 ° C ~ 200 ° C for at least 30 minutes and then allowed to cool for 30 minutes to perform vacuum heating to remove adsorbed 水分是很有效的。 Water is very effective. 还有，除了前述真空加热以外，也可以在非活性气体气氛下在200~250°C下进行加热同时进行UV照射。  Further, in addition to the foregoing vacuum heating, may be heated at 200 ~ 250 ° C in an inert gas atmosphere while UV irradiation. 还有，也可以不进行真空加热，而只是在非活性气体气氛下在200~ 250°C下进行加热同时进行UV照射处理。 Further, the vacuum heating may not be performed, but only heated at 200 ~ 250 ° C in an inert gas atmosphere simultaneously with UV irradiation treatment. 还有，根据需要，也可以在成膜室512中在大气压或减压下采用喷墨法、旋转涂布法和喷雾法等形成由高分子材料而来的空穴注入层。  Further, if necessary, an ink jet method may be employed at atmospheric or reduced pressure in the film forming chamber 512, a spin coating method and a spray method or the like is formed from a polymer material of a hole injection layer. 还有，通过喷墨法涂布之后，再采用旋转涂布法使膜厚度均一也是可以的。 Further, after coating by an ink jet method, a spin coating method and then a film having a uniform thickness are also possible. 同样地，通过喷雾法涂布之后，再采用旋转涂布法使膜厚度均也是可以的。 Likewise, after passing through the spray coating method, a spin coating method and then the film thickness are also possible. 还有，将基板坚直放置，在真空中通过喷墨法成膜也是可以的。 Further, the substrate is placed straight Kennedy, by an inkjet method in a vacuum film formation are possible. 比如，也可以在成膜室512中在第一电极（阳极）整个表面上涂布起到空穴注入层（阳极缓冲层）作用的聚（亚乙基二氧噻吩）/聚（苯乙烯磺酸）的水溶液（PED0T/PSS)、 聚苯胺/樟脑磺酸水溶液（?4见/054)、？  For example, the coating can also function as a hole injection layer (anode buffer layer) over the entire surface (anode) electrode in the film forming chamber 512 a first poly (ethylene dioxythiophene) / poly ( styrenesulfonic acid aqueous solution) of (PED0T / PSS), polyaniline / camphor sulfonic acid aqueous solution (? 4 see / 054) ,? 1'^^54卜?了?0£1(、或？?84等，烧结也是可以的。烧结时，优选在多级加热室523a、523b中进行。 1 '^^ 54 Bu? A? 0 £ 1 (, ?? 84 or the like, are also possible sintering when the sintering is preferably performed in a multistage heating chamber 523a, 523b in. 使用旋转涂布法等涂布法形成由高分子材料而来的空穴注入层（HIL)时，能够获得平坦度提高、其上面所形成的膜的覆盖量和膜厚均一性均良好的膜。  using a spin coating method and the like is formed by a hole injection layer (HIL) from a polymer material, the flatness is possible to obtain improved coverage of the film formed thereon and the film thickness uniformity of the average good film. 特别是由于发光层的膜厚均一，所以能够获得均匀的发光效果。 In particular, since the light-emitting layer having a uniform thickness, it is possible to obtain a uniform glow. 此时，在通过涂布法形成空穴注入层之后，在即将通过蒸镀法成膜之前，在大气压下或真空下加热（100~200°C )是优选的。 In this case, after forming the hole injection layer by a coating method, immediately before the film formation by an evaporation method, it was heated at atmospheric pressure or under vacuum (100 ~ 200 ° C) are preferred. 比如，也可以在以海绵清洁完第一电极（阳极）表面之后，将其运送入基板载入室520中，然后运送至成膜室512a中，采用旋转涂布法在其整个表面上涂布聚（亚乙基二氧噻吩）/聚（苯乙烯磺酸）水溶液（PED0T/PSS)，使膜厚达到60nm，然后运送至多级加热室523a、523b中，80°C煅烧10分钟，然后200°C烧结1小时，进一步运送至多级真空加热室521中，在即将进行蒸镀之前真空加热（170°C，加热30分钟，冷却30分钟），然后运送至成膜室506W1、506W2、506W3中，在不使其接触大气的情况下通过蒸镀法形成EL层。  for example, may be performed after completion of the cleaning sponge first electrode (anode) surface, which was carried into a substrate loading chamber 520, and then transported to the film formation chamber 512a, the spin coating method on the entire surface coated poly (ethylene dioxythiophene) / poly (styrenesulfonic acid) solution (PED0T / PSS), a film thickness of 60nm, and then transported to the multistage heating chamber 523a, 523b of, 80 ° C calcined 10 minutes , 200 ° C and then sintered for 1 hour and transported further multistage vacuum heating chamber 521, the vacuum heating immediately before the deposition (170 ° C, heated for 30 minutes, cooling for 30 minutes), and then transported to the film formation chamber 506W1,506W2 , 506W3, the EL layer is formed by evaporation method without being exposed to air it. 特别是， 采用IT0膜作为阳极材料，当表面上存在着凹凸和微粒时，通过使PED0T/PSS的膜厚至少为30nm，就能够降低这些影响。 In particular, use of IT0 film as the anode material, and when there are irregularities on the surface of the particles, by PED0T / PSS film thickness of at least 30 nm, these effects can be reduced. 还有，为了改善PED0T/PSS的润湿性，在UV处理室531中进行紫外线照射是优选的。 Further, in order to improve wettability PED0T / PSS, the ultraviolet irradiation in the UV treatment chamber 531 it is preferred. 还有，通过旋转涂布法形成PED0T/PSS的膜时，由于在整个表面上成膜，所以选择性地除去基板的端面和边缘部位、接线部位、阴极与下部配线的接线区域等是优选的，在预处理室503中使用掩模通过0 2打磨等而选择性地除去之是优选的。 When  There are, PED0T / PSS film is formed by spin coating, since the deposition on the entire surface, the bonding region is selectively removed and an edge portion of the end face, the wiring portion, and the cathode of the lower wiring board and the like are preferable, by using the mask 02 in the pre-grinding chamber 503 of selectively removing the like are preferable. 预处理室503具有等离子体发生装置，通过激发选自Ar、H、F和0中的一种或多种气体而产生等离子体，由此进行干蚀刻。 Pretreatment chamber 503 having a plasma generating apparatus, plasma is generated by exciting selected from Ar, H, F, and one kind of 0 or more gases, whereby dry etching. 通过使用掩模，能够选择性地只将不需要的部分除去。 , It is possible to selectively remove only the unnecessary portion by using a mask. 而且，将蒸镀掩模贮存在掩模贮存室524a、524b中，适当的是，在进行蒸镀时将其运送到成膜室中。  Further, the vapor deposition mask is stored in a mask storage chamber 524a, 524b, the appropriate that, during shipping to remote vapor deposition chamber. 使用大型基板时，由于掩模的面积增大，所以就得扩大固定掩模用的框架，很难贮存数目很多的掩模，因此这里提供了2个掩模贮存室524a、524b。 When using a large substrate, since the mask area increases, so must the expanding mask frame fixing, hard mask storage lot number, therefore there is provided two masks reservoir chamber 524a, 524b. 在掩模贮存室524a、524b中进行蒸镀掩模的清洁操作也是可以的。 Vapor deposition mask in the mask storage chamber 524a, 524b in the cleaning operation is also possible. 还有，由于蒸镀时掩模贮存室是空的， 所以它也可以贮存经过成膜或经过处理的基板。 Also, since the reservoir chamber when the deposition mask is empty, it can be treated through the substrate film or storage. 然后，将基板从运送室502运送至运送接收室507中，进一步地，在不使其与大气接触的情况下将基板从运送接收室507运送至运送室508中。  Then, the substrate transport to the receiving chamber 507 from transfer chamber 502 transported further, in the case where the atmosphere is not brought into contact with the substrate is transferred from the transfer to the receiving chamber 507 of the transfer chamber 508. 然后，适宜地将基板运送至与运送室508相连的成膜室506W1、506W2、506W3中，适宜地形成成为空穴传输层、发光层、电子传输层的、由低分子而来的有机化合物层。  Then, the substrate is suitably transported to the deposition chamber 506W1,506W2,506W3 connected to the transport chamber 508, suitably formed becomes the hole transport layer, emission layer, electron transport layer, made from the low molecular weight the organic compound layer. 通过适当选择EL材料，就发光元件整体而言，能够形成显示出单色（具体而言是白色）发光现象的发光元件。 By appropriately selecting the EL material on the whole light-emitting element, it is possible to form a monochrome display (specifically, white) light emitting element emitting phenomenon. 而且，基板在各个运送室之间运送时不与大气接触，而是经由运送接收室540、 541、511运送的。 Further, the substrate is not in contact with the atmosphere during transport between the individual transport chamber, transporting the receiving chamber 540 but via, 541,511 conveyed. 然后，通过运送室514内设置的运送设备将基板运送至成膜室510内，然后形成阴极。  Then, the transport device through the transport chamber 514 provided the substrate is transported to the film-forming chamber 510, and then forming the cathode. 该阴极优选透明或半透明的，以利用了电阻加热的蒸镀法来形成金属膜（MgAg、MgIn、 CaF 2、LiF、CaN等合金,或元素周期表1族或2族元素与错通过共蒸镀法形成膜，或这些材料的层合膜）的薄膜（lnm~10nm),或者以前述金属膜的薄膜（lnm~10nm)与透明导电膜的层合膜作为阴极是优选的。 The cathode is preferably transparent or translucent to the evaporation method using resistance heating to form a metal film (MgAg, MgIn, CaF 2, LiF, CaN and other alloys, or a periodic table group 1 or group 2 element and wrong by co a thin film deposition method to form a film, or a laminate film of these materials) is (lnm ~ 10nm), a thin film or the metal film (lnm ~ 10nm) laminate film with a transparent conductive film is preferable as the cathode. 还有，将基板从运送室508经由运送接收室511运送至运送室514之后，将其运送至成膜室509中，然后采用溅镀法形成透明导电膜。 Further, after the substrate 508 transported from the transport chamber through the transfer chamber 511 to transfer chamber receives 514, which is transported to the film forming chamber 509, and a transparent conductive film using the sputtering method. 通过以上工序，可形成叠层结构的发光元件，在该结构中具有包含有机化合物的层。  Through the above steps, the light emitting element may be formed of the laminated structure, a layer containing an organic compound in the structure. 还有，将其运送至与运送室514相连的成膜室513中，然后形成由氮化硅膜、或氮氧化硅膜而来的保护膜而进行密封也是可以的。  Further, it is transported to the film forming chamber 513 is connected with the transport chamber 514, and then to seal also may be formed of a silicon nitride film, a silicon oxynitride film or a protective film comes. 在这里，在成膜室513内提供了由硅构成的靶子、或者由氧化硅构成的靶子，或氮化硅构成的靶子。 Here, the film forming chamber 513 is provided within a target made of silicon, or a target made of silicon oxide or silicon nitride target configuration. 还有，对着固定着的基板而移动棒状靶子，由此形成保护膜也是可以的。  In addition, fixed against movement of the rod-shaped target substrate, thereby forming a protective film it is also possible. 还有，对着固定着的棒状靶子，通过移动基板的方式而形成保护膜也是可以的。 Further, the rod against a fixed target, is also possible to form a protective film by way of a moving substrate. 比如，使用由硅构成的圆盘状靶子，通过成膜室内的气氛成为氮气气氛或含有氮和氩的气氛，就能够在阴极上形成氮化硅膜。  For example, using a disk-shaped silicon target through the atmosphere in the deposition chamber be a nitrogen atmosphere or an atmosphere containing nitrogen and argon, a silicon nitride film can be formed on the cathode. 还有，形成以碳为主要成分的薄膜（DLC膜、 CN膜、非晶碳膜），以此作为保护膜也是可以的，另外，提供可采用CVD法的成膜室也是可以的。 Further, a thin film (DLC film, CN film, amorphous carbon film) containing carbon as a main component, as the protective film are possible, additionally, be employed to provide the film forming chamber of the CVD method are possible. 采用等离子体CVD法（典型的是RF等离子体CVD法、微波CVD法、电子回旋共振（ECR) CVD法、热丝CVD法等）、燃烧火焰法、溅镀法、离子束蒸镀法、激光蒸镀法等能够形成类金刚石碳膜（称为DLC膜）。 A plasma CVD method (typically, RF plasma CVD method, a microwave CVD method, electron cyclotron resonance (the ECR) CVD method, hot filament CVD method and the like), a combustion flame method, a sputtering method, an ion beam deposition method, a laser vapor deposition method capable of forming a diamond-like carbon (referred to as DLC film). 成膜时用的反应气体采用了氢气和烃系气体（比如CH 4、C2H2、C6H6 等），通过辉光放电使其电离，离子朝着施加了负自偏压的阴极加速碰撞而成膜。 The reaction gas for film formation using hydrogen gas and hydrocarbon gas (such as CH 4, C2H2, C6H6, etc. ), it ionized by glow discharge, the negative ions towards the self-bias voltage is applied to the cathode to accelerate the deposition collision. 还有，采用C2H4气体和N 2作为反应气体来形成CN膜是可以的。 Further, using C2H4 gas and N 2 as a reactive gas to form CN film is possible. 而且，DLC膜和CN膜等是对可见光透明或半透明的绝缘膜。 Further, DLC film and the CN film are insulating films transparent or semitransparent to visible light. 对可见光透明指的是可见光透过率为80-100%，对可见光半透明指的是可见光的透过率为50-80%。 Transparent to visible light means a visible light transmittance of 80-100%, translucent to visible light means a visible light transmittance of 50-80%. 还有，代替前述保护层而在阴极上形成由第一无机绝缘膜、应力松弛膜和第二无机绝缘膜的叠层而来的保护层也是可以的。  In addition, instead of the protective layer is formed of a first inorganic insulating film, a protective layer laminated stress relaxation film and a second inorganic insulating film can also come in on the cathode. 比如，在形成阴极之后，运送至成膜室513中， 在此形成5nm~50nm的第一无机绝缘膜，再运送至成膜室506W1和506W2和506W3等中， 通过蒸镀法形成l〇nm~100nm且具有吸湿性和透明性的应力松弛膜（无机层，或含有有机化合物的层等），进一步地，运送至成膜室513中，形成5nm~50nm的第二无机绝缘膜。 For example, after forming the cathode, transported to the film forming chamber 513, a first inorganic insulating film 5 nm ~ 50nm is formed here, and then transported to the film formation chamber 506W1 and 506W2 and 506W3, and the like, is formed by an evaporation method l〇nm ~ 100nm and the stress relaxation film (an inorganic layer, or a layer containing an organic compound, and the like) having hygroscopicity and transparency, and further transported to the film forming chamber 513, a second inorganic insulating film of 5nm ~ 50nm. 然后，将发光元件已形成的基板运送至密封室519中。 Substrate  Then, the light emitting element is formed transported to the sealing chamber 519. 密封基板是从外部向装载室517中设置并提供的。  The sealing substrate is disposed toward the loading chamber 517 from the outside and provided. 将密封基板从装载室517运送至运送室527中，根据需要，将其运送至旨在贴合干燥剂和滤光片（颜色滤光片、偏振片等） 等的光学膜（光学7 )贴合室529中。 The sealing substrate 527 is conveyed to the conveying chamber from the loading chamber 517, as needed, to be transported to the intended bonding the optical film and the desiccant filter (a color filter, a polarizing plate etc.) (optical 7) attached co-chamber 529. 还有，在装载室517中设置预先贴有光学膜(颜色滤光片、偏振片）的密封基板也是可以的。 Further, in the loading chamber 517 is provided with a pre-attached optical film (color filter, a polarizing plate) The sealing substrate is also possible. 而且，为了除去密封基板中的水分等杂质，预先在多级加热室516中进行缓慢降温是优选的。  Further, the sealing substrate in order to remove impurities such as moisture, previously subjected to slow cooling is preferred multistage heating chamber 516. 然后，在密封基板上形成旨在与已设置了发光元件的基板贴合的密封材料时， 在分配室515中形成密封材料，将已形成了密封材料的密封基板经由运送接收室542运送至运送室514中，进一步将其运送至密封基板贮存室530中。 Then, it is intended to have is provided with a sealing material of the substrate of the light emitting element is bonded, form a sealing material dispensing chamber 515 is formed on the sealing substrate, the sealing substrate has been formed to a sealing material conveyed through the transfer chamber 542 receives transport chamber 514, which is further transported to the sealing substrate 530 in the reservoir chamber. 而且，这里表示的是在密封基板上形成密封材料的实例，但本发明并不具体限于此，在形成了发光元件的基板上形成密封材料也是可以的。 Further, there is shown the example of forming the sealing material on the sealing substrate, but the present invention is not particularly limited thereto, is formed in the sealing material is formed on the substrate of the light emitting element is also possible. 还有，将蒸镀时使用的蒸镀掩模贮存在密封基板贮存室530中也是可以的。 Further, the deposition mask used for the substrate during the deposition stored in a sealed storage chamber 530 are possible. 而且，由于本实施例针对的是两面发射型结构，所以可以将密封基板运送至光学膜贴合室529中，由此在密封基板的内侧贴合光学膜。  Further, since the present embodiment is directed to both sides emission type structure, the sealing substrate can be conveyed to the optical film bonded to the chamber 529, whereby the optical film is bonded to the inner side of the sealing substrate. 或者，在将设置了发光元件的基板与密封基板贴合之后，将其运送至滤光片贴合室529中，就可以在该密封基板的外侧贴合光学膜（颜色滤光片、或偏振片）。 Alternatively, after the substrate provided with the light emitting element and the sealing substrate is bonded, which is transported to bonding the filter chamber 529, can be bonded to the optical film (color filter on the outside of the sealing substrate, or polarization sheet). 然后，在密封室519中使基板和密封基板贴合，接着利用密封室519中设置的紫外线照射设备对贴合好的一对基板进行UV光照射，以使密封材料固化。  Then, in a sealed chamber between the substrate and the sealing substrate 519 bonded, followed by ultraviolet irradiation device 519 provided in the sealing chamber of the bonded pair of substrates is irradiated with UV light to cure the seal material. 从未设置TFT的密封基板一侧进行UV光照射是优选的，因为该TFT会遮挡光。 Never sealing side of the TFT substrate is irradiated with UV light is preferred because of the TFT will block light. 而且，虽然这里以紫外线固化+热固化树脂作为密封材料，但就该粘合剂而言没有特别的限制，使用只通过紫外线固化的树脂等也是可以的。 Further, although the ultraviolet curing + thermosetting resin as the sealing material, but the relation is not particularly limited in terms of the binder, simply by using an ultraviolet curable resin or the like is also possible. 还有，密封的空间中不填充非活性气体，填充树脂也是可以的。  Further, the sealing space is not filled with inert gas, filling resin is also possible. 就下面发射型的情况而言，当紫外线是从密封基板一侧照射时，由于阴极不透光，所以对填充树脂材料没有特别的限制，紫外线固化型树脂和不透明性树脂等均是可以采用的，但是两面发射型的情况下，当紫外线从密封基板一侧照射时，紫外线会通过阴极而使EL层遭受损坏，因此不使用紫外线固化性树脂是优选的。 Here it is the case emission type, when ultraviolet rays are irradiated from the sealing substrate side, since the cathode is opaque so there is no particular limitation on the resin material is filled, an ultraviolet curable resin and an opaque resin may be employed so is , but in the case on both sides emission type, the sealing substrate side when irradiated with ultraviolet rays from the ultraviolet rays by the cathode of the EL layer from being damaged, and therefore does not use an ultraviolet curable resin is preferable. 因此，在两面发射型的情况下，以热固化的透明性树脂作为填充树脂是优选的。 Thus, in a case where both sides emission type, a thermosetting resin is used as the filling of a transparent resin it is preferred. 然后，将贴合好的一对基板从密封室519运送至运送室514,然后经由运送接收室542从运送室527运送至取出室525中，最后取出。  Then, the bonded pair of substrates conveyed to the transport chamber 514 from the sealing chamber 519, and then transferred from the transfer chamber 527 through the transfer chamber 542 to remove the receiving chamber 525, and finally removed. 还有，从取出室525中取出之后，进行加热以使密封材料固化。  Further, after removal from the extraction chamber 525, heated to cure the seal material. 就上面发射型而言，当填充的是热固化性树脂时，在对密封材料进行加热处理以使其固化的同时也能够使该树脂发生固化。 On top emission type, when the filling is a thermosetting resin, the sealing material is subjected to heat treatment to cure while it is possible to cure the resin occurs. 如前所述，由于采用了图5所示的制造装置，将发光元件完全密封在密闭空间中而不使其不暴露在大气之下，就可以制造出可靠性高的发光装置。  As described above, the use of the manufacturing apparatus shown in FIG. 5, the light emitting element is completely sealed in the closed space so as not to be exposed to without air, can manufacture a highly reliable light-emitting device. 而且，虽然这里在图中没有表示，但是通过控制基板在各个处理室中的运送路线， 可以设计出能实现全自动化操作的控制装置。  Moreover, although not shown in the drawing, but by controlling the respective substrate conveyance path in the processing chamber, the control means can be designed to achieve a fully automated operation. 图6表示的是蒸镀装置顶视图的一个实例。  FIG. 6 shows a top view of one example of a vapor deposition apparatus. 就图6而言，成膜室101具有基板支持装置（图中未表示）、设置了蒸镀开合门（图中未表示）的第一蒸镀源托座l〇4a和第二蒸镀源托座104b、为了移动这些蒸镀源托座而设置的装置（图中未表示）、制造减压气氛的装置（真空排气装置）。 A first vapor deposition source and the second holder l〇4a  For purposes of FIG. 6, the film forming chamber 101 having a substrate support means (not shown), the vapor deposition is provided to open and close a door (not shown) of the two evaporation source holder 104b, the means for moving the evaporation source holder is provided (not shown), means (evacuating means) for producing a reduced pressure atmosphere. 利用该减压气氛制造装置，可将成膜室101真空排气至5 X 10_3Torr (0. 665Pa)或以下，优选1(T4~10-6Pa的真空度。 The manufacturing apparatus using the reduced-pressure atmosphere, the film forming chamber 101 may be evacuated to 5 X 10_3Torr (0. 665Pa) or below 1 (degree of vacuum is preferably T4 ~ 10-6Pa. 还有，在成膜室中，将在蒸镀时用于引入数seem之多的材料气的气体引入系统(图中未表示）与为使成膜室内部达到常压而设的非活性气体仏1~、队等）引入系统（图中未表示）相连。  Further, in the deposition chamber, the gas used during vapor deposition material gas is introduced into the number seem much introduction system (not shown) and the inside of the deposition chamber reaches the set pressure and Fo ~ 1 inert gas, team, etc.) into the system (not shown) is connected. 进一步设置清洗气体（选自&、&、即3或02中的一种或多种气体）引入系统也是可以的。 Further provided a cleaning gas (& selected, &, i.e. one or more gases of 3 or 02) introduced into the system are possible. 而且，所希望的是，不要使材料气从气体引入口以最短的距离流向气体排出□。 Further, it is desirable not to make the material gas is introduced from the gas inlet to the gas flow discharged shortest distance □. 还有，通过在成膜时有意地引入材料气，使材料气的成分包含在有机化合物膜中， 可以形成高密度的膜，也能防止氧和水分等使性能变差的杂质侵入膜中并在其中扩散。  Moreover, by intentionally introducing during the deposition material gas, so that the material gas component contained in the organic compound film can be formed in high density film, oxygen can be prevented and deterioration of the performance of moisture intrusion of impurities and wherein the diffusion membrane. 具体而言，就材料气而言，可以采用选自硅烷系气体（甲硅烷、乙硅烷、丙硅烷等）、SiF 4、GeH4、 GeF4、SnH4、或烃系气体（01 4、切2、(：2114、(：611 6等）中的一种或多种。而且，也可包含这些气体经氢和氩等稀释之后的混合气体。向装置中引入的这些气体，采用的是在向装置内部引入之前经过气体精制机高度提纯过的气体。因此，为了使气体在经过高度提纯之后在引入蒸镀装置中，必须提供气体精制机。如此一来，能够预先除去气体中所含的残留气体（氧、水分、其它杂质等），因此就能够防止这些杂质被引入装置内部。 Specifically, it is a material gas, it is selected from silane-based gas may be employed (monosilane, disilane, trisilane, etc. ), SiF 4, GeH4, GeF4, SnH4, or hydrocarbon gas (014, cut 2, ( : 2114. (: 6116, etc.) and one or more may also be included after a mixed gas of these gases and hydrogen diluted with argon gas introduced into the device, employed in the interior of the apparatus. after the gas refiner height of the purified gas. Accordingly, in order that the gas is highly purified after the introduction of the vapor deposition apparatus, it is necessary to provide a gas refiner. This makes it possible to remove in advance residual gas contained in the gas prior to introduction ( oxygen, moisture, other contaminants, etc. ), and therefore it is possible to prevent these impurities from being introduced inside the apparatus. 比如，通过在蒸镀时引入甲硅烷气体，使膜中含有Si，在发光元件完成之后，当存在着针孔和短路等不良区域时，该不良区域会通过产生热量而使Si发生反应，由此形成SiOx、SiCx等绝缘性的绝缘物，进而降低针孔和短路区域中的漏泄电阻，从而使这些缺陷(黑点）不能继续发展，即也会获得所谓的自愈效果。  For example, by introducing monosilane gas at the time of the deposition, a film containing Si, after completion of the light emitting element, when there are defects such as pinholes and a short circuit area, the defective region can occur by generating heat the Si the reaction, thereby forming SiOx, SiCx like insulating insulator, thereby reducing leakage resistance pinhole and short-circuit region, so that these defects (black dots) can not continue to grow, i.e., a so-called self-healing effect will be obtained. 而且，在引入前述材料气时，除了低温泵以外，组合设置涡轮分子泵和干泵是优选的。  Further, when the material gas is introduced, in addition to the cryopump, a turbo molecular pump provided in combination and dry pumps are preferred. 还有，在成膜室101中，蒸镀源托座104能够沿图6中点划线所示的移动路线往复多次移动。  Further, in the film forming chamber 101, a deposition source holder 104 can reciprocate repeatedly crossed the midpoint along the movement route shown in FIG. 6. 而且，图6中所示的移动路线只是一个实例，本发明并不限于此。 Further, the movement route shown in FIG. 6 is only an example, the present invention is not limited thereto. 为了使膜厚度均一，沿图6所示的移动路线缓慢挪移而使蒸镀源托座移动，由此进行蒸镀是优选的。 In order to make the film thickness uniform along the moving path shown in FIG. 6 creep slowly moving the evaporation source holder, whereby vapor deposition is preferable. 还有，沿同一移动路线往复移动也是可以的。 Also, moving along the same route back and forth movement is also possible. 还有，通过在每个移动路线区间内适当地改变蒸镀托座的移动速度，预期能够获得膜厚均一化效果，而且也可以缩短成膜所消耗的时间。 Further, by appropriately changing the deposition holder movement path in each moving speed range, the intended effect can be obtained a uniform film thickness, the film formation time can be shortened but also consumed. 比如，可以使蒸镀源托座以30cm/分钟~300cm/分钟的速度沿X方向或Y方向移动。 For example, the evaporation source holder can move at a speed of 30cm / min ~ 300cm / min in the X or Y direction. 还有，在制造白色发光元件时，也可以进行如图9所示的局部蒸镀法。  Further, when manufacturing a white light emitting element may be performed locally deposition method shown in FIG. 9. 在构成面板的区域中，进行局部蒸镀时至少要包含构成显示区域的那些区域。 When at least in the region constituting the panel, those containing local deposition area to form a display region. 通过进行局部蒸镀，可以防止在无需蒸镀的区域内发生蒸镀。 By partial evaporation, vapor deposition can be prevented from occurring in the region without vapor deposition. 为了进行局部蒸镀，采用了开合门（图中未表示）。 For partial evaporation, using the opening and closing door (not shown). 通过适当的开合，蒸镀时不使用掩模。 By appropriately opening and closing, without using a mask during the deposition. 图9是制造多面板时的一个实例，900是大型基板、901 是成膜室、904是可移动的蒸镀托座，906是坩埚。 FIG 9 is an example when manufacturing a multi-panel, 900 is a large substrate, a deposition chamber 901, 904 is movable bracket evaporation, 906 crucible. 还有，在蒸镀源托座104a、104b上设置封入了蒸镀材料的容器（坩埚106)。  There is provided a vapor deposition material is enclosed container (crucible 106) in the evaporation source holder 104a, 104b. 这里表示的是在1个蒸镀源托座104a、104b上设置2个坩埚的实例。 Here is represented by 104a, 2 instances 104b is provided on the crucible at a vapor deposition source holder. 还有，为设置室103设置了膜厚计（图中未表示），这是它的一个特征。 Further, the setting chamber 103 is provided for the film thickness meter (not shown), which is one of its characteristics. 在这里，膜厚计在蒸镀源移动的期间是不进行监测的，由此降低膜厚计的更换频率。 Here, film thickness meter during the movement of the vapor deposition source is not monitored, thereby reducing the frequency of replacement of film thickness meter. 而且，在1个蒸镀源托座上提供多个容器（贮存有机化合物的坩埚、蒸镀皿）时， 为了使有机化合物彼此相互混合，就要使其蒸发方向（蒸发中心）在被蒸镀物位置处交叉， 由此希望坩埚的安装角度是倾斜的。 When  Further, a plurality of containers (crucibles organic compound reservoir, evaporation dish) in an evaporation source holder base, intermixed with each other in order to make the organic compound, it is necessary to evaporate direction (the center of the evaporator) in It was deposited at the intersection position, whereby the desired mounting angle of the crucible is inclined. 还有，蒸镀源托座在坩埚用设置室中随时待机，直至蒸镀速度稳定后才进行加热和保温操作。  Further, the evaporation source holder at any time in the standby chamber provided with a crucible, deposition rate until after the heating and holding operations performed stably. 而且，在坩埚用设置室内设置了膜厚监测装置（图中未表示）。 Further, provided in the crucible chamber is provided a film thickness monitoring device (not shown). 待蒸镀速度稳定后，将基板运送至成膜室102中，相对掩模（图中未表示）进行位置对准，然后打开开合门，使蒸镀托座移动。 After stable deposition speed, transported to the film forming chamber 102 of the substrate opposite the mask (not shown) for positioning, and then open the door opening and closing, the deposition holder moving. 而且，使用CCD照相机（图中未表示）来确证蒸镀掩模和基板的对准情况。 Further, using a CCD camera (not shown) to confirm the alignment of the deposition mask and the substrate. 基板和蒸镀掩模上分别预先设置了对准标记，由此来进行位置控制是可以的。 Vapor deposition mask and the substrate alignment mark, respectively, provided in advance, thereby performing the position control is possible. 蒸镀结束后，蒸镀托座在坩埚用设置室中移动，关闭开合门。 After the deposition, the deposition holder moving in a crucible provided with a chamber, closing the door opening and closing. 关闭开合门后，将基板运送至运送室102中。 After closing the door opening and closing the substrate conveyance chamber 102 to the transport. 还有，在图6中，通过使多个蒸镀托座104a、104b在设置室103中待机，在1个蒸镀托座中的材料耗光后，再以1个蒸镀托座替换之，因此就能够进行顺序移动而实现连续成膜了。  Further, in FIG. 6, by a plurality of vapor deposition holder 104a, 104b disposed in the standby chamber 103, an evaporation material is run out of the holder, and then to a vapor deposition Torr Alternatively the seat, and therefore can be performed while sequentially moving a continuous film formation. 还有，当一个蒸镀托座在成膜室内移动时，也可以向空蒸镀托座上补充EL材料。 Further, when a vapor deposition chamber in the holder moves, the vapor deposition may be supplemented seat bracket EL material to the air. 通过使用多个蒸镀托座104,可以进行高效的成膜。 By using a plurality of socket 104 deposition, the deposition may be performed efficiently. 还有，蒸镀托座104a、104b只可以设置2个坩埚，不过可以设置4个坩埚而只设置2个或1个坩埚进行蒸镀。  Further, the deposition holder 104a, 104b may be provided only two crucibles, but may be provided only four crucibles 2 provided a crucible, or vapor deposition. 根据本发明能够缩短成膜所需要的时间。  According to the present invention can shorten the time required for film formation. 在以前，补充EL材料时要使成膜室对大气开放，坩埚补充结束之后，还必须抽真空，因此补充所需的时间就会很长，这就是生产率之所以低的原因。 In the past, to make the deposition chamber is open to the atmosphere, added after the end of the crucible, when the pump must replenish the EL material in vacuo, the time will be required to supplement long, which is the reason why the low productivity reasons. 还有，由于还能够减少成膜室内壁的粘附物，因此能够减少对成膜室内壁的清洁等维护操作的频率。  Further, since the deposition chamber wall can also reduce the adherend, it is possible to reduce the frequency of cleaning of the deposition chamber walls and other maintenance operations. 还有，将坩埚106设置在蒸镀托座104a、104b上的操作，在设置室103b中也进行。  Further, the crucible 106 is provided in the vapor deposition holder 104a, the operation 104b, disposed in the chamber 103b is also performed. 图7(A)和图7(B)中表示了运送时的情况。 FIG 7 (A) and 7 (B) shows a case where the transport. 而且，与图6相应的部分使用了相同的符号。 Further, the corresponding portions of FIG. 6 using the same reference numerals. 将坩埚106在由上部分721a和下部分721b构成的容器中在真空密封状态下由设置室103 的门112运送进来。 The crucible 106 is composed of an upper portion of the container 721a and a lower portion 721b in a vacuum sealed state provided by the incoming conveying chamber door 112 103. 首先，将运送进来的容器承载在容器安装用旋转台109上，摘下固定件702。 First, the incoming shipping containers carried on the rotating table 109 mounting the container fixing member 702 off. （图7(A))内部是真空状态，所以在大气压下即使摘下固定件702也无法取下来。 (FIG. 7 (A)) is inside a vacuum state, even under atmospheric pressure off the fixing member 702 can not be taken down. 然后，在设置室l〇3a内进行真空排气，由此使容器盖子（上部分721a)处于可以取下来的状态。 Then, in the evacuated chamber l〇3a provided, whereby the container lid (portion 721a) in a state can be taken down. 针对容器在运送时的状况采用图7(A)进行具体的说明。  The FIG. 7 (A) for the container during transportation condition will be specifically described. 第二容器被分为运送时使用的上部分（721a)和下部分（721b)，该容器具有设置在第二容器上部分的为了使第一容器（坩埚）固定而用的固定装置706、为该固定装置施加压力所用的弹簧705、设置在第二容器下部分上且构成了使第二容器减压保持的气体路线的气体引入口708、固定上部分容器721a和下部分容器721b用的0型圈以及固定件702。 Upper portion is used for transport into the second container (721a) and a lower portion (721b), the container having a fixing device 706 is disposed on the second portion of the container to the first container (crucible) used in fixing, for the the fixing means 705 exert a spring pressure employed, provided at an upper portion of the second container and the second container under reduced pressure to form a gas path of the gas introduction port holder 708, the container on the fixed portion 721a and a lower portion of the container 721b with 0 and a fixing ring member 702. 在该第二容器内，设置了封入有经过精制的蒸镀材料的第一容器106。 In the second container, provided the container is sealed after the first purified vapor deposition material 106. 而且，第二容器是由含有不锈钢的材料构成的，第一容器106可以由含有钛的材料形成。 Further, the second container is made of a material composed of stainless steel comprising, a first container 106 may be formed of a material containing titanium. 在材料制造商处将精制过的蒸镀材料封入第一容器106中。  In the material manufacturer purified through vapor deposition material is enclosed in the first container 106. 然后，通过0型圈将第二容器的上部分721a和下部分721b合在一起，通过固定件702将上部分容器721a和下部分721b固定，由此将第一容器106封闭在第二容器之中。 Then, the 0-ring on the second container portion 721a and lower portion 721b together, the upper portion 721a and lower portion 721b of the container is fixed by the fixing member 702, thereby closing the first container in the second container 106 of the in. 然后，通过气体引入口708对第二容器减压，进一步地置换成氮气气氛，通过调节弹簧705利用固定装置706固定第一容器106。 Then, under reduced pressure through the gas introduction port 708 pairs of the second container further nitrogen substitution, by adjusting the spring 705 is fixed by the fixing device 706 of the first container 106. 而且，在第二容器内设置干燥剂也是可以的。 Further, a drying agent is provided in a second container are also possible. 如此一来，使第二容器内保持真空、减压和氮气气氛，这样就连稍许的氧和水等吸附在蒸镀材料上都能够防止。 Thus, the vacuum holding the second vessel, and a nitrogen atmosphere under reduced pressure, so even slight oxygen and water adsorbed on the vapor deposition material can be prevented. 然后，通过运送盖子用的机械手108将容器盖子向上拿起，将其移动至安装盖子用台107。  Then, with the cap by the transport robot 108 will pick up the container lid, the lid mounted to move with the stage 107. 而且，本发明的运送装置并不限于图7(B)所示从第一容器106上方夹持（抓住） 该第一容器来进行运送的结构，夹持第一容器侧面进行运送的结构也是可以的。 Further, the conveying apparatus of the present invention is not limited to FIG. 7 (B) shown above the nip 106 from a first container (seize) the structure of the first container to the transport, clamping the first side of the vessel is conveyed structural possible. 然后旋转容器安装用旋转台109,然后将容器下部分留在旋转台上，利用坩埚运送用机械手110只拿起坩埚。  rotating the container and then mounting the turntable 109, and then the remaining portion of the lower container on the turntable, the use of the transport crucible crucible 110 to pick up the robot. （图7(B))最后，将坩埚设置在在设置室103中待机的蒸镀托座104a、104b 上。 (FIG. 7 (B)) Finally, the crucible disposed in the deposition chamber is provided in the holder 103 on standby 104a, 104b. 还有，在设置室103中设置了清洗气体（选自H2、F2、NF 3、或02中的一种或多种气体）引入系统，使用清洗气体来清洁蒸镀托座和开合门等部件也是可以的。  Further, in the setting chamber 103 is provided in the purge gas (from H2, F2, NF 3, or 02 in one or more gases) introduced into the system, using a cleaning gas to clean deposition holder and opening doors closing member are also possible. 还有，在设置室中设置等离子体发生装置，使其产生等离子体，或者向该设置室内引入通过等离子体电离的气体，对设置室内壁、蒸镀托座和开合门等部件进行清洁，通过真空排气装置进行排气也是可以的。 There are disposed in the setting chamber plasma generator, a plasma was generated, or introduced to the chamber is provided, disposed on the inner wall, a vapor deposition holder member and the opening and closing of doors by a plasma ionized cleaning gas, the exhaust gas by vacuum evacuation device are also possible. 清洁用的等离子体可以通过激发选自41~、队、11 2、？ Cleaning plasma excitation may be selected by 41 ~, team, 112 ,? 24?3、或02中的一种或多种气体而产生。 24? 3, or 02 in one or more gases produced. 照此方式使蒸镀托座104a、104b移动至设置室103中，在设置室中通过清洁操作就能够保持成膜室的清洁度。  In this manner the deposition bracket 104a, 104b is provided to move the chamber 103, is provided in the chamber cleaning operation can be maintained by the cleanliness of the deposition chamber. 还有，本实施例能够和实施例1自由组合。  Further, embodiments can be freely combined with embodiment 1 and the embodiment of the present embodiment. 在图5中所示的任意一个成膜室506W1、 506W2、506W3中都可以设置图6所示的蒸镀装置，在图5中所示的设置室526a~526n中也可以设置图7所示的设置室。 Shown in any one film forming chamber 5 506W1, 506W2,506W3 can be provided in the vapor deposition apparatus shown in FIG. 6, is provided in the chamber shown in FIG. 5 526a ~ 526n may be provided as shown in FIG. 7 setting room. 在这里，表示的是不对大气开放就可以进行成膜室内清洁和蒸镀掩模的清洁操作的成膜室的实例。  Here, it represents the open air can not be instantiated deposition chamber cleaning operation of cleaning deposition chamber and a vapor deposition mask. 图8是本实施例成膜装置的截面视图一个实例。 8 is a sectional view of an embodiment example of a film forming apparatus of the present embodiment. 如图8所示，它表示的是在通过高频电源1300a和电容1300b连接的蒸镀掩模1302a和电极1302b之间产生等离子体1301的实例。  As shown, the example is to generate a plasma between the deposition mask 1301 1302a 1302b and the electrode 1300a connected by a high frequency power supply and a capacitor 1300b 8 it represents. 在图8中，将基板连接在设置部位（图中点线部位所示的部位）上，提供固定在托座上的蒸镀掩模1302a，进一步地在其下方设置了可加热至各自不同温度的蒸镀源托座1322。  In FIG. 8, the connection substrate (dotted line portion shown in FIG portions) provided on the site, to provide a vapor deposition mask 1302a fixed to the seat bracket, further provided thereunder may be heated to different respective temperatures of the deposition source holder 1322. 而且，蒸镀源托座1322可通过移动装置1328沿X方向、Y方向、Z方向或构成旋转方向的0方向移动。 Further, the evaporation source holder 1322 may be via the mobile device 1328 in the X direction, Y direction, Z direction constituting a direction or 0 rotation direction. 通过针对蒸镀托座设置的加热装置（典型地是电阻加热法）将内部的有机化合物加热至升华温度，使其汽化而蒸镀在基板表面上。  means for heating the evaporation holder is provided (typically a resistance heating method) The inside of the organic compound is heated to a sublimation temperature, vaporize and deposited on the substrate surface. 而且，在蒸镀时，将基板开合门1320移动至不妨碍蒸镀的位置处。 Further, at the time of the deposition, the substrate 1320 is moved to open and close the door position does not interfere with the deposition. 还有，也设置了与蒸镀托座同时移动的开合门1321，需要蒸镀时将其移动至不妨碍蒸镀的位置上。 There is also provided a vapor deposition holder while the opening and closing movement of the door 1321, as required to move it to the deposition location does not interfere with the deposition. 还有，蒸镀时可设置气体引入系统，通过该系统可以通入微量的比有机化合物材料颗粒更小的颗粒，即由原子半径小的材料构成的气体，由此就能够使有机化合物膜中含有原子半径小的材料。  Further, when the deposition gas may be introduced into the system is provided, an organic compound material may be introduced into micro particles smaller than the particles through the system, i.e., a gas of small atomic radius material, whereby it is possible to make the organic small atomic radius material film contains a compound. 具体而言，就前述的原子半径小的材料气而言，可以采用选自硅烷系气体（甲硅烷、乙硅烷、丙硅烷等）、SiF 4、GeH4、GeF4、SnH4或烃系气体（CH 4、C2H2、C2H4、C 6H6 等）中的一种或多种。 Specifically, on the small atomic radius material gas, it is selected from silane-based gas may be employed (monosilane, disilane, trisilane, etc. ), SiF 4, GeH4, GeF4, SnH4 or a hydrocarbon-based gas (CH 4 , C2H2, C2H4, C 6H6 and other one or more) of. 而且，还包含这些气体经氢、氩等稀释之后而获得的混合气体。 Moreover, further comprising a mixed gas after diluted by hydrogen, argon and the like is obtained. 向装置内部引入的这些气体，采用的是在引入装置内部之前经过气体精制机高度提纯过的气体。 The gas introduced into the interior of the device, employed in the apparatus prior to introduction into the interior through the gas refiner height of the purified gas. 因此，为了将气体经过高度提纯之后再引入蒸镀装置中，必须提供气体精制机。 Therefore, in order after the gas is highly purified and then introduced into the vapor deposition apparatus, it is necessary to provide a gas refiner. 由此， 就能够预先除去气体中所含的残留气体（氧、水分、其它杂质等），所以就可以防止向装置内部引入这些杂质。 With this, the residual gas contained in the gas (oxygen, moisture, other contaminants, etc.) can be removed beforehand, so it is possible to prevent the introduction of impurities into the inside of the apparatus. 还有，通过加热基板用加热器1304等加热装置来加热基板，由此使所引入的材料气成分高效地沉积在基板上也是可以的。  Further, a heater 1304 or other heating means to heat the substrate by heating the substrate, whereby the material gas component introduced efficiently deposited on the substrate are also possible. 还有，通过等离子体发生装置来产生自由基也是可以的。  Further, also possible to generate radicals by a plasma generating apparatus. 比如以甲硅烷为例，通过等离子体发生装置，能够生成SiH x、SiHx0y、SiOy等氧化硅前体，这些前体与来自蒸镀源的有机化合物材料一起沉积在基板上。 Silyl such as, for example, by a plasma generating device capable of generating SiH x, SiHx0y, SiOy as silicon oxide precursor, the precursor is deposited with the organic compound material from a deposition source onto the substrate. 甲硅烷很容易与氧和水分发生反应，因此也可以降低成膜室内的氧浓度和水分含量等。 Silyl readily react with oxygen and moisture, thereby also reducing the oxygen concentration and water content in the deposition chamber and the like. 还有，为了能够引入各种气体，就真空排气处理室而言，提供了磁悬浮型涡轮分子泵1326和低温泵1327。  Also, to be able to introduce various gases, in terms of the vacuum exhaust treatment chamber, a magnetic levitation type turbo molecular pumps 1326 and 1327 cryopump. 通过这些泵，可使成膜室最终达到1(T 5~l(T6Pa的真空度。而且， 在通过低温泵1327真空排气之后，关闭低温泵1327,通过涡轮分子泵1326进行真空排气， 同时一边通入数seem之多的材料气一边进行蒸镀。还有，采用离子电镀法，使成膜室内的材料气电离，一边让其附着在蒸发的有机材料上一边进行蒸镀也是可以的。 These pumps can eventually reach the film formation chamber 1 (T 5 ~ l (degree of vacuum T6Pa Further, after the evacuation by a cryopump 1327, 1327 cryopump closed, evacuated by a turbo molecular pump 1326, at the same time while passing a number seem much gas was vapor-deposited material. also, ion plating method, the deposition material gas ionization chamber, while allowed to be deposited on the side adhering vaporized organic material are also possible . 蒸镀结束之后，取出基板，然后进行清洁操作，以便在不对大气开放的情况下除去成膜装置内部设置的夹具和成膜装置内壁上附着的蒸镀材料。 After  completion of deposition, the substrate is taken, and then the cleaning operation to remove deposition material adhering to the inner walls of the jig and the film forming apparatus is provided inside the film formation apparatus in the case does not open to the atmosphere. 还有，在清洁时，将蒸镀托座1322移动至设置室（这里图中未表示）中，进行该操作是优选的。  Further, in cleaning, the holder 1322 to move the vapor deposition chamber is provided (not illustrated here), and this operation is preferred. 在进行清洁时，使线电极1302b向与蒸镀掩模1302a相对的位置上移动。 During cleaning , the wire electrode 1302b opposite to the movement of the position of the deposition mask 1302a. 进一步地，向成膜室1303中引入气体。 Further, the gas is introduced into the film forming chamber 1303. 就成膜室1303中引入的气体而言，可以采用选自Ar、H 2、 F2、NF3*02中的一种或多种气体。 The deposition chamber 1303 to the gas introduction, it may be selected from a group Ar, H 2, F2, NF3 * 02 in one or more gases. 然后，从高频电源1300a对蒸镀掩模1302a施加高频电场，激发气体仏1~、1^、即3、或0)而产生等离子体1301。 Then, plasma is generated from the high frequency power source 1301 is applied to the evaporation mask 1300a 1302a high frequency electric field, the excitation gas Fo ~ 1, ^ 1, i.e. 3, or 0). 由此在成膜室1303内产生等离子体1301，从而使在成膜室内壁、防粘屏蔽板1305或蒸镀掩模1302a上附着的蒸镀物发生汽化而排到成膜室之外。 Thereby generating plasma in the film formation chamber 1301 1303, so that the vapor deposition chamber in the wall thereof, the release or deposition mask shielding plate 1305 is attached 1302a occurrence of vaporization is discharged outside the deposition chamber. 通过图4中所示的成膜装置，维护时不使成膜室内部或蒸镀掩模与大气接触就可以进行清洁操作。 By forming apparatus shown in FIG. 4, inside the film forming chamber without contact with the atmosphere or deposition mask maintenance cleaning operation can be performed. 而且，这里表示的是在蒸镀掩模1302a和该掩模与前述蒸镀源托座1306之间设置的电极1302b之间产生等离子体的实例，但并不特别限于此，配备等离子体发生装置也是可以的。 Further, there is shown is an example of a plasma generated between the electrode 1302b is provided between the mask and the deposition mask 1302a and the deposition source holder 1306, but is not particularly limited thereto, with plasma generator it is also fine. 还有，电极1302b也可以与高频电源连接，线电极1302b也可以是板状和网状电极等，能以喷头方式引入气体的电极也是可以的。 Further, the electrode 1302b may be connected to the high frequency power supply, the wire electrode 1302b may be plate-shaped mesh electrode and the other electrode can be introduced to the showerhead gas are also possible. 而且，就等离子体发生方法而言，可以适宜地采用ECR、ICP、螺旋波、磁控管、双频、三极管或LEP法等。 Moreover, it occurs in terms of the plasma method, can be suitably employed ECR, ICP, helicon wave, the magnetron, dual, or triode LEP method. 还有，前述利用等离子体进行的清洁操作，每完成一次成膜操作就进行一次是可以的，完成几次成膜操作之后再进行也是可以的。  In addition, the use of plasma cleaning operation, every time the completion of a film-forming operation is to be performed, and then also possible after completion of the deposition operation several times. 还有，本实施例能够与实施方案1-4、实施例1、实施例2中的任意一个自由组合。  Further, Example 1-4 of the present embodiment is capable of, Example 1, Example 2, in any freely combined. 在本实施例中，以图12表示制造在具有绝缘表面的基板上具有以有机化合物层作为发光层的发光元件的发光装置（两面发射结构）的实例。  In the present embodiment, in FIG. 12 represents the manufacturing example of an organic compound having a layer of a light-emitting element as a light emitting device emitting layer (both sides emission structure) on a substrate having an insulating surface. 而且，图12(A)是表示发光装置的顶视图，图12⑶是图12(A)沿A-A'剖切得到的截面视图。  Further, FIG. 12 (A) is a top view of a light emitting device, FIG 12⑶ is FIG. 12 (A) along A-A sectional view taken 'obtained. 点线所示的1101是源信号（^ >信号）线驱动电路、1102是象素部分、1103 是门信号（^ -卜信号）线驱动电路。 Shown in dotted line 1101 is a source signal (^> signal) line driver circuit, a pixel portion 1102, 1103 is a gate signal (^ - Bu signal) line driver circuit. 还有，1104是透明的密封基板，1105是第一密封材料，在被第一密封材料1105包围的内侧以透明的第二密封材料1107填充。 Also, 1104 is a transparent sealing substrate 1105 is a first seal material, a transparent second sealing material 1107 is filled in the inside surrounded by the first sealing material 1105. 而且，在第一密封材料1105中含有保持基板间隔用的间隙材料。 Further, a gap material comprising maintaining the substrate interval with the first sealing material 1105. 而且，1108是用来传输向源信号线驱动电路1101和门信号线驱动电路1103输入的信号的配线，并且接收从构成外部输入端子的FPC(软印刷电路）1109而来的视频信号和时钟信号等。  Further, the wiring 1108 is used to transmit the drive signal circuit 1101, and gate signal line driver circuit 1103 is inputted to the source signal line 1109 and receives video coming from constituting an external input terminal FPC (flexible printed circuit) signal and a clock signal. 而且，这里仅图示出FPC，但是在该FPC上安置印刷配线基底（PWB)也是可以的。 Also here only FPC is illustrated, but the placement of the printed wiring substrate (PWB) on the FPC are possible. 然后，针对截面结构对图12(B)进行说明。  Then, for the cross-sectional structure of FIG. 12 (B) will be described. 在透明基板1110上形成驱动电路和象素部分，这里表示了作为驱动电路的源信号线驱动电路1101和象素部分1102。 Forming the driver circuit and the pixel portion on the transparent substrate 1110, shown here as a source signal line driver circuit for driving the pixel portion 1102 and the circuit 1101. 而且，该源信号线驱动电路1101形成了由n通道型TFT 1123和p通道型TFT 1124 组合而来的CMOS电路。  Further, the source signal line driver circuit 1101 is formed of a CMOS circuit TFT 1124 by a combination of n-channel type TFT 1123 and p-channel type come. 还有，也可以采用已知的CMOS电路、PM0S电路或NM0S电路来形成构成驱动电路的TFT。 There may be employed a known CMOS circuit, PMOS circuit, or a circuit formed NM0S TFT forming a driving circuit. 还有，本实施例中虽然表示的是在基板上形成的驱动集成化结构，但不一定非有这个必要，可以不在基板上而是在外部形成。 Further, although the present embodiment indicates the driving integrated structure formed on the substrate, but this need not necessarily have to be formed not on the substrate but externally. 还有，对以聚硅膜或无定形硅膜为活性层的TFT的结构没有特别的限制，顶门型（卜7 -卜型）TFT是可以的，底门型（*' 卜A y -卜型）TFT也是可以的。 Also, there is no particular limitation on the structure of poly silicon film or amorphous silicon film as the active layer of the TFT, type top door (Bu 7-- BU type) TFT is a bottom gate type (* 'Bu A y - Bu type) TFT also possible. 还有，象素部分1102是由多个象素形成的，该象素含有开关用TFT1111、电流控制用TFT 1112和与其漏极电连接的第一电极（阳极）1113。  Further, the pixel portion 1102 is formed by a plurality of pixels containing the pixel switching TFT 1111, a current control of the first electrode (anode) 1113 and a TFT 1112 is electrically connected to the drain thereof. 就电流控制用TFT 1112而言， 可以是n通道型TFT，也可以是p通道型TFT，但是在与阳极接线时，优选p通道型TFT。 With respect to the current controlling TFT 1112, the TFT may be an n-channel type, p-channel type may be the TFT, but in connection with the anode, preferably a p-channel type TFT. 还有，适当地设置保持电容（图中未表示）是优选的。 Further, appropriately set storage capacitor (not shown) are preferred. 而且，虽然这里仅表示了在所设置的无数个象素中一个象素的截面结构，而且表示的是对这一个象素采用2个TFT的实例，但是适当地采用3个或更多个TFT也是可以的。 Further, although the cross-sectional structure only shows numerous pixels provided in a pixel, and this is represented by a pixel TFT using example 2, but suitably employed three or more TFT it is also fine. 这里表示的是第一电极1113与TFT的漏极直接连接的结构，因此所希望的是，第一电极1113的下层是由硅形成的漏极和电阻接触器可以取下的材料层，与含有机化合物的层相连的最上层是功函大的材料层。  Here shows the structure of a first electrode 1113 is directly connected to the drain of the TFT, and therefore it is desirable that the lower electrode 1113 is the first material layer and the drain ohmic contact is formed of silicon can be removed , the uppermost layer is a functional layer material and a layer containing an organic compound Handa connected to. 比如可以采用透明导电膜（IT0(氧化铟氧化锡合金）、氧化铟氧化锌合金（In 203-Zn0)、氧化锌（ZnO)等）。 The transparent conductive film may be employed such as (IT0 (indium tin oxide alloy), indium oxide-zinc oxide alloy (In 203-Zn0), zinc oxide (ZnO) and the like). 还有，在第一电极（阳极）1113的两端形成绝缘物（称为bank、隔片、阻挡层、屏障等）1114。  In addition, the insulator is formed (referred to Bank, the spacer, the barrier layer, barrier, etc.) across the first electrode 1114 (anode) 1113. 绝缘体1114可以由有机树脂膜或含硅的绝缘膜形成。 The insulator 1114 may be formed of an organic resin film or an insulating film containing silicon. 这里，采用正型感光性丙烯酸类树脂膜作为绝缘物1114,形成图12所示形状的绝缘物。 Here, a positive photosensitive acrylic resin film is used as the insulator 1114, the insulator is formed of a shape 12 shown in FIG. 为了获得良好的覆盖量，所以在绝缘物1114的上端部分或下端部分形成具有曲率的曲面。  To achieve good coverage, it is a curved surface having curvature at an upper end portion or lower end portion of the insulator 1114. 比如，在采用正型感光性丙烯酸类树脂作为绝缘物1114材料时，优选仅在绝缘物1114的上端部分形成具有曲率半径（0.2iim~3iim)的曲面。 For example, when using a positive photosensitive acrylic resin as the insulating material 1114, preferably only a curved surface having a radius of curvature (0.2iim ~ 3iim) in the upper end portion of the insulator 1114. 还有，作为绝缘物1114， 可以使用因感光性光的作用而不溶于浸蚀剂的负型材料，或因光的作用而溶于浸蚀剂的正型材料，其中的任何一种均可以使用。 Further, as the insulating material 1114 may be used instead of light by the action of a photosensitive negative type etchants dissolved materials, or dissolved by the action of light and a positive type material etchant, any of which can be use. 还有，在绝缘体1114上覆盖以氮化铝膜、氮化氧化铝膜、碳为主要成分的膜，或由氮化硅膜构成的保护膜也是可以的。  In addition, covered with an aluminum nitride film, aluminum oxide nitride film, a film containing carbon as a main component on the insulator 1114, or a protective film made of a silicon nitride film is also possible. 还有，在第一电极（阳极）1113上通过蒸镀法选择性地形成含有有机化合物的层1115。  Further, the layer 1115 containing an organic compound formed over the first electrode (anode) 1113 by a vapor deposition method to selectively. 在本实施例中，采用实施方案2所示的制造装置对含有有机化合物的层1115进行成膜，由此获得均一的膜厚。 In the present embodiment, the manufacturing apparatus using the embodiment shown two pairs of layer 1115 containing an organic compound film is formed, thereby obtaining a uniform film thickness. 进一步地，在含有有机化合物的层1115上形成第二电极（阴极）1116。 Further, a second electrode (cathode) 1116 on the layer 1115 containing an organic compound. 就阴极而言，可以采用功函小的材料（Al、Ag、Li、Ca或这些金属的合金MgAg、 MgIn、AlLi、CaF 2*CaN)。 On the cathodes, small work function materials can be used (Al, Ag, Li, Ca, or an alloy of these metals MgAg, MgIn, AlLi, CaF 2 * CaN). 在这里，为了使发射光能够透过，作为第二电极（阴极）1116,采用了膜厚较薄的金属薄膜（MgAg :膜厚10nm)、膜厚llOnm的透明导电膜（IT0(氧化铟氧化锡合金）、氧化铟氧化锌合金（In20 3-Zn0)和氧化锌（ZnO)等）的叠层。 Here, in order to make the emitted light can pass through, a second electrode (cathode) 1116, a metal thin film using the thin film thickness (MgAg: film thickness 10 nm), a transparent conductive film having a thickness of llOnm (IT0 (oxide, indium oxide tin alloy), indium oxide-zinc oxide alloy (In20 3-Zn0), and zinc oxide (ZnO), etc.) laminate. 然后，形成具有第一电极（阳极）1113、含有有机化合物的层1115、以及第二电极（阴极）1116的发光兀件1118。 Then, 1113, the layer 1115 containing an organic compound and a second electrode (cathode) having a light emitting member Wu first electrode (anode) 1116 to 1118 are formed. 在本实施例中，依次层叠CuPc (膜厚20nm)、a -NPD (膜厚30nm)、含有以钼为中心金属的有机金属络合物（Pt (ppy) acac)的CBP (膜厚30nm)、BCP (膜厚20nm)和BCP: Li (膜厚40nm)，以此作为含有有机化合物的层1115,从而得到白色发光。 Embodiment, sequentially stacked in the present embodiment of CuPc (thickness of 20nm), a -NPD (thickness of 30nm), containing molybdenum as a central metal of the organometallic complex (Pt (ppy) acac) of CBP (thickness of 30nm) , the BCP (thickness of 20nm) and BCP: Li (thickness of 40nm), as a layer 1115 containing an organic compound, to thereby obtain white light. 在本实施例中，发光元件1118是以白色发光为例进行说明的，因此设置了具有着色层1131和遮光层（BM) 1132的颜色滤光片（为了简化，这里罩涂层在图中没有表示）。 In the present embodiment, the light emitting element 1118 is described as an example of the white light, a color filter thus provided a colored layer 1131 and a light blocking layer (BM) 1132 is (for simplicity, there is no overcoat in FIG. representation). 还有，在这种两面发光显示装置中，设置了用于防止背景透底现象和防止外光反射的光学膜1140、1141。  Further, in such dual emission display device is provided for preventing the phenomenon of background through the end of the optical film and preventing the reflection of external light 1140,1141. 就光学膜1140、1141而言，可以适宜地组合偏振膜（高透过型偏振片、薄型偏振片、白偏振片、高性能染料系偏振片、AR偏振片等）、相位差膜（宽频带1/4入片、温度补偿型相位差膜、扭转相位差膜、宽视角相位差膜、双轴取向型相位差膜等）和亮度增强膜等来使用。 1140,1141 to an optical film, it can be suitably integrated polarizing film (a high transmission polarizer, thin polarizer, white polarizer, high-performance dye-based polarizing plate, AR polarizing plate), a retardation film (wide band 1/4 of the sheet, a temperature compensation type retardation film, twisted retardation film, wide viewing angle retardation film, a biaxially oriented retardation film type) and a brightness enhancement film used. 比如，采用偏振膜作为光学膜1140、1141，使光的偏振方向彼此垂直设置，由此能够获得防止背景透底的效果和防反射效果。 For example, as an optical film using a polarizing film 1140,1141, so that polarization direction of light is provided perpendicular to each other, thereby preventing the background can be obtained through the end effects and anti-reflection effect. 此时，除了通过发光进行显示的部分以外，其余部分都变成黑色，无论从哪一侧来看该显示，都看不到背景透底现象。 In this case, except for the display portion by the light emitting, and the rest are turned black, regardless of which side of the display point of view, do not see through the end of the background phenomenon. 还有，从发光屏而来的发射光只通过1个偏振片，因此能够原样显示。 Further, the light emitted from the luminescent screen by only one polarizing plate, it is possible to display as is. 而且，如果2个偏振片不正交而是彼此的光偏振方向呈±45度以内，优选±20度以内的话，也能够获得前述效果。  Further, if the two polarizing plates are not orthogonal to each other, but the polarization direction of the light was within ± 45 degrees, preferably within ± 20 degrees, then the effect can be obtained. 有了光学膜1140、1141，观察者在从一侧观察时，就能够防止因看到背景透底现象而很难看清显示的问题。  With the optical films 1140,1141, when viewed from a viewer side, it is possible to prevent problems due to the background seen through the end of the phenomenon is difficult to see the display. 进一步地，再增加1片光学膜也是可以的。  Further, the optical film 1 further increases are possible. 比如，虽然一个偏振膜吸收S波（或P 波），但在偏振膜与发光屏之间设置将S波（或P波）反射至发光元件一侧使其再生的亮度增强膜也是可以的。 For example, while a polarizing film absorbing an S wave (or P wave), but between the polarizing film and the luminescent screen disposed S wave (or P wave) is reflected to the light emitting element side of the brightness enhancement film it is also possible regeneration. 结果一来，通过偏振片的P波（或S波）就会增多，就能够获得累积光量增大的效果。 As a result, the P wave (or S wave) will increase polarizer can be obtained the effect of increasing the amount of integrated light. 在两面发光面板中，从发光元件所经过的层结构是不同的，因此发光状态(亮度、色度等）是不同的，光学膜对于调节两个发光面板的发光平衡而言是有用的。 In the both surfaces of the light emitting panel, the light emitting element passes from the layer structure is different, and therefore light emission state (luminance, color, etc.) are different, the optical film for adjusting the balance of light emission in terms of two light-emitting panel is useful. 还有， 在两面发光面板中，外界光的反射度也是不同的，因此从反射更多光波的角度而言，优选在偏振片和发光面板之间设置亮度增强膜。 Further, in the both sides of the light-emitting panel, the external light reflectance is also different, and therefore more light waves reflected from the point of view, preferably between the polarizer and the light emitting panel disposed brightness enhancement film. 还有，为了密封发光元件1118,形成了透明的保护叠层1117。  Further, in order to seal the light emitting element 1118 is formed of a transparent protective lamination layer 1117. 该透明的保护叠层1117是由第一无机绝缘膜、应力松弛膜、第二无机绝缘膜的叠层构成的。 The transparent protective lamination layer 1117 is composed of a first inorganic insulating film, a stress relaxation film, a second inorganic insulating film is stacked configuration. 就第一无机绝缘膜和第二无机绝缘膜而言，可以采用通过溅镀法或CVD法获得的氮化硅膜、氧化硅膜、氧化氮化硅膜（SiNO膜（组成比N>0)或SiON膜（组成比N<0))、以碳为主要成分的薄膜(比如DLC膜、CN膜）。 On the first inorganic insulating film and the second inorganic insulating film, the silicon nitride film can be obtained by sputtering or CVD, a silicon oxide film, a silicon nitride oxide film (a SiNO film (composition ratio of N> 0) or SiON film (composition ratio of N <0)), films (such as DLC film, CN film) containing carbon as a main component. 这些无机绝缘膜对水分具有高的阻挡效果，但如果膜厚过厚的话， 膜应力会增大，容易产生剥离和膜剥落现象。 These inorganic insulating films have high blocking effect on the water, but if too thick, it will increase the film stress, easy peeling and film peeling phenomenon. 但是，通过在第一无机绝缘膜和第二无机绝缘膜之间夹入应力松弛膜，就能够在松弛应力的同时吸收水分。 However, by sandwiching the stress relaxation film between the first inorganic insulating film and the second inorganic insulating film can be relaxed while absorbing moisture stress. 还有，即使成膜时不管什么原因而在第一无机绝缘膜上形成了微小的孔隙（针孔等），通过应力松弛膜可以填塞之，而且通过在其上设置第二无机绝缘膜，可产生对水分和氧极高的阻挡效果。 Further, even if for whatever reason are formed in the first inorganic insulating film during the deposition of minute pores (pinholes), can be passed through a packing stress relaxation film, and on which is provided by the second inorganic insulating film, barrier effect generating high moisture and oxygen. 还有，就应力松弛膜而言，优选与无机绝缘膜相比应力更小而且具有吸湿性的材料。 Further, it is the stress relaxation film, it is preferable as compared with the inorganic insulating film stress and less hygroscopic material. 而且，所希望的是具有透光性的材料。 Further, it is desirable that a material having translucency. 还有，就应力松弛膜而言，可以采用含有a-NPD (4,4'-双[N-(萘基）-N_苯基氨基]联苯）、80? (浴铜灵）、1〇1^了4(4,4'，4"-三（^3-甲基苯基4-苯基氨基）三苯基胺）、Alq 3 (三-8-喹啉醇合铵络合物）等有机化合物的材料膜，这些材料膜具有吸湿性， 如果膜厚很薄的话，基本上是透明的。还有，MgO、Sr0 2、SrO具有吸湿性和透光性，而且能够通过蒸镀法获得薄膜，因此能够用作应力松弛膜。在本实施例中，将采用了硅靶而在含有的氮和氩气氛下成膜的膜，即，使用对水分和碱金属等杂质具有高阻挡效果的氮化硅膜作为第一无机绝缘膜或第二无机绝缘膜，采用通过蒸镀法获得Alq 3薄膜作为应力松弛膜。还有， 为了使发射光通过透明保护叠层，透明保护叠层的总膜厚尽可能薄是优选的。 Further, it is the stress relaxation film, it may be employed containing a-NPD (4,4'- bis [N- (naphthyl) -N_ phenylamino] biphenyl), 80? 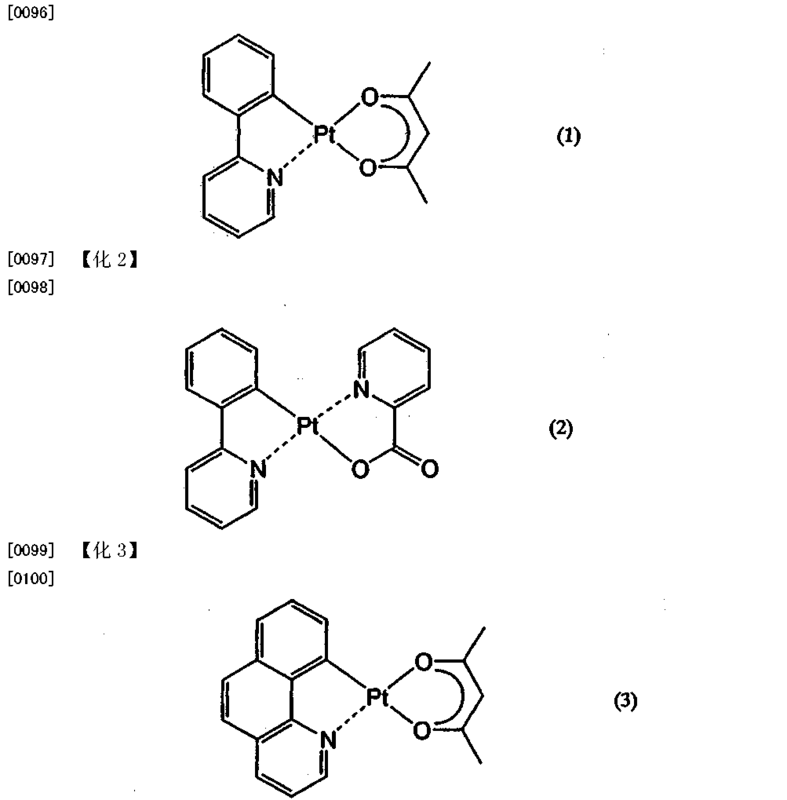 (Bathocuproine), 1 〇1 ^ 4 (4,4 ', 4 "- tris (4- ^ 3-methylphenyl phenylamino) triphenylamine), Alq 3 (tris-8-quinolinolato ammonium complex ) the organic material film and the like, these material films having hygroscopic property, if the film thickness is thin, it is substantially transparent. also, MgO, Sr0 2, SrO having hygroscopicity and transparency, but also by vapor deposition method to obtain a thin film, can be used as the stress relaxation film. in this embodiment, the use of a silicon target and forming a film under an atmosphere containing argon and nitrogen, i.e., having a high barrier to moisture and impurities such as alkali metal effect of the silicon nitride film as the first inorganic insulating film or the second inorganic insulating film, Alq 3 was obtained in the film by an evaporation method as a stress relaxation film. Further, in order to make the emitted light through the transparent protective lamination layer, a transparent protective laminate the total thickness is preferably as thin as possible. 还有，为了密封发光元件1118,在非活性气体气氛下借助第一密封材料1105、第二密封材料1107贴合密封基板1104。  Further, in order to seal the light emitting element 1118 by the first sealing material 1105 in an inert gas atmosphere, the second sealing material 1107 bonded sealing substrate 1104. 而且，就第一密封材料1105而言，优选米用环氧系树月旨。 Further, it is a first sealing material 1105, the preferred epoxy-based meter aimed tree months. 还有，就第二密封材料1107而言，只要是具有透光性的材料即可没有特别的限制，典型地优选采用紫外线固化或热固化的环氧树脂。 Also, concerning the second sealing material 1107, it is as long as a material having translucency is not particularly limited, typically preferred epoxy ultraviolet curable or thermally curable. 在这里，采用了折射率为1.50、粘度500cps、 肖氏D硬度90、拉伸强度3000psi、Tg为150°C、体积电阻为1X10 15Q • cm、耐压450V/mil 的高耐热性UV环氧树脂（Electrolight公司制造：2500Clear)。 Here, using a refractive index of 1.50, a viscosity of 500 cps, a Shore D hardness of 90, tensile strength 3000psi, Tg of 150 ° C, a volume resistivity of 1X10 15Q • cm, the withstand voltage 450V / mil UV high heat resistance ring epoxy resin (Electrolight Corporation: 2500Clear). 还有，通过在一对基板之间填充第二密封材料1107,与一对基板之间形成空间（非活性气体）的情况相比，能够提高整体透过率。 There are cases, between a pair of substrates forming a space (inert gas) by filling the second sealing material 1107 between the pair of substrates in comparison, the transmittance can be improved overall. 还有，所希望的是，第一密封材料1105、第二密封材料1107希望尽可能是不透过水分和氧的材料。 There, it is desirable that the first sealing material 1105 and second sealing material 1107 is desirable as moisture and oxygen impermeable material. 还有，在本实施例中，作为构成密封基板1104的材料，除了玻璃基板和石英基板等以外，可以采用FRP(玻璃纤维增强塑料）、PVF(聚氟乙烯）、聚酯薄膜、聚酯或丙烯酸类树脂等构成的塑料基板。  Further, in the present embodiment, as the material constituting the sealing substrate 1104, in addition to a glass substrate and a quartz substrate may be used an FRP (Fiberglass Reinforced Plastics), PVF (polyvinyl fluoride), mylar, a plastic substrate made of polyester or acrylic resin. 还有，在采用第一密封材料1105和第二密封材料1107粘结完密封基板1104之后，为了进一步覆盖侧面（暴露面），也可以采用第三密封材料进行密封。 Further, after using the first sealing material 1105 and second sealing material 1107 End bonding the sealing substrate 1104, in order to further cover the side face (exposed face), a third may be sealed with sealing material. 如前所述，通过用第一密封材料1105、第二密封材料1107将发光元件密封，能够使发光元件与外部完全隔离，由此防止从外部而来的水分和氧等促使有机化合物层性能变差的物质侵入。  As described above, by using a first sealing material 1105, a second sealing member sealing the light emitting element 1107, the light emitting element can be completely isolated from the outside, thereby preventing the organic compound from prompting from external moisture and oxygen, etc. performance deterioration material layer intrusion. 因此，能够获得可靠性高的发光装置。 Thus, the light emitting device having high reliability can be obtained. 还有，在制造上面发射型发光装置时，阳极优选是具有反射性的金属膜（铬、氮化钛等）。  Further, in the manufacture of top emission type light emitting device, the anode is preferably a reflective metal film (chromium, titanium nitride, etc.). 还有，在制造下面发射型发光装置时，阴极优选采用Al、Ag、Li、Ca或这些金属的合金MgAg、Mgln、AlLi构成的金属膜（膜厚50nm_200nm)。 Further, in the following manufacturing light-emitting device is emitted, the cathode preferably using Al, Ag, Li, or MgAg Ca alloy of these metals, Mgln, a metal film is formed of AlLi (film thickness 50nm_200nm). 还有，本实施例可以与实施方案1-4、实施例1-3中的任意一个自由组合。  Further, the present embodiment may be 1-4, in any of Examples 1-3 in combination with a free embodiments. 在本实施例中，就装备了至少2个显示装置的电器的实例利用图12进行说明。  In the present embodiment, an example of electrical equipment on at least two display apparatus 12 will be described using FIG. 利用本发明能够制造具备EL组件的电器。 The present invention can be manufactured by using an EL module includes a collector. 就这些电器而言，比如可以提及摄象机、数码照相机、；f _ ^ >型显示器（头戴式显示器）、导航系统、放音装置（汽车音响、组合音响）、个人笔记本电脑、游戏机、便携式信息终端（掌上电脑、手提电话、掌上游戏机或电子图书等）、 装备了记录介质的图象再现装置（具体而言，装备了数字通用光盘OVD)等再现记录介质并显示图象的显示器的装置）等。 These appliances, it can be mentioned such as cameras, digital cameras,; f _ ^> type display (head mounted displays), navigation systems, sound reproduction devices (car audio and audio components), notebook personal computers, game machines, portable information terminals (PDAs, mobile phones, handheld game machines, electronic books, etc. ), equipped with a picture recording medium reproducing apparatus (specifically, a digital versatile disk equipped OVD) like recording medium and reproducing the display image a display device) and the like. 图12(A)是个人笔记本电脑的斜视图，图12(B)是表示其折叠状态的斜视图。  FIG. 12 (A) is a perspective view of a notebook personal computer, FIG. 12 (B) is a perspective view showing a folded state thereof. 个人笔记本电脑包含本体2201、框体2202、显示部分2203a、2203b、键盘2204、外部接线插槽2205、点触式鼠标2206等。 Notebook PC includes a main body 2201, a housing 2202, a display portion 2203a, 2203b, a keyboard 2204, an external connection socket 2205, mouse 2206 and the like touch. 图12(A)和图12⑶所示的个人笔记本电脑装备了主要用以全彩色显示图象的高画质显示部分2203a和主要用以单色显示文字和符号等的显示部分2203b。  FIG. 12 (A) and notebook PCs equipped shown 12⑶ primarily to high-quality full-color display image display section 2203a and a display portion mainly for monochromatic display of characters and symbols 2203b. 还有，图12(C)是掌上电脑的斜视图。  Further, FIG. 12 (C) is a perspective view of handheld computers. 图12(D)是表示其背侧的斜视图。 FIG. 12 (D) is a perspective view showing the back side thereof. 掌上电脑包含本体2301、显示部分2302a、2302b、开关2303、操作键2304、红外线接口2305。 Handheld includes a body 2301, a display portion 2302a, 2302b, a switch 2303, operation keys 2304, an infrared port 2305. 它配备了主要用以全彩色显示图象的高画质显示部分2302a和主要用以单色显示文字和符号等的显不部分2302b。 It is equipped with a full-color display is mainly used for a high-quality image display portion 2302a and is mainly used for monochrome display characters or symbols is not substantial portion 2302b. 还有，图12(E)是数字照相机，它包含本体2601、显示部分2602、框体2603、外部接线插槽2604、遥控器信号接收部分2605、图象接收部分2606、电池2607、声音输入部分2608、操作键2609等。  Further, FIG. 12 (E) is a digital camera, which includes a main body 2601, a display portion 2602, a casing 2603, an external connection socket 2604, a remote control signal receiving portion 2605, an image receiving portion 2606, a battery 2607, a sound input portion 2608, operation keys 2609 and the like. 显示部分2602是两面发光面板，在其一面上是主要用以全彩色显示图象的高画质显示部分，而另一面上主要能够单色显示文字和信号等。 Dual emission display panel part 2602 is, on one side full-color display is mainly used for high-quality image display section, while the other surface can mainly display text and monochrome signals. 而且，显示部分2602 能在安装位置处旋转。 Further, the display portion 2602 can be rotated at the mounting position. 本发明能够适用于显示部分2602。 The present invention is applicable to the display portion 2602. 还有，图12(F)是手提电话的斜视图，图12(G)是表示其折叠状态的斜视图。  Further, FIG. 12 (F) is a perspective view of the portable telephone, FIG. 12 (G) is a perspective view showing a folded state thereof. 手提电话包含本体2701、框体2702、显示部分2703a、2703b、声音输入部分2704、声音输出部分2705、操作键2706、外部接线插槽2707、天线2708。 Mobile phone comprising a main body 2701, a housing 2702, a display portion 2703a, 2703b, an audio input portion 2704, a sound output portion 2705, operation keys 2706, external connection slot 2707, an antenna 2708. 图12(F)和图12(G)所示的手提电话，配备了主要用以全彩色显示图象的高画质显示部分2703a和主要用以按区域彩色显示文字和符号等的显示部分2703b。  FIG. 12 (F) and FIG. 12 (G) represented by mobile phones, equipped with a full-color display is mainly used for high-quality image display portion 2703a and the main press region for a color display of characters or symbols The display section 2703b. 此时，显示部分2703a中采用了颜色滤光片，显示部分2703b中使用了可产生区域彩色效果的光学膜。 At this time, the display portion 2703a of a color filter used in the display portion 2703b may be used in an optical film color effect generation region. 还有，本实施例可以与实施方案1-4、实施例1-4中的任意一个自由组合。  Further, the present embodiment may be 1-4, any of Examples 1-4 in combination with a free embodiments. 图16表示采用了本发明显示装置的手提电话在充电时的情况的图。  FIG. 16 shows the case of using the present invention shows a portable telephone device during charging of FIG. 虽然在图16 中，手提电话在打开状态时两侧发光，但是在关闭状态下也是可以的。 Although in FIG. 16, on both sides of the light emitting cell phone in an open state, but in the closed state are also possible. 一般地，在采用了发光元件的显示装置中，发光元件的性能会随着时间而变差，亮度会逐步下降。 Generally, in a display device using the light emitting element, the performance of the light emitting element deteriorates over time, the brightness will gradually decline. 特别地，在发光元件是按逐个象素方式设置的显示装置中，根据部位的不同，象素的点亮频率是不同的， 因此随着部位的不同，性能变差的程度是不同的。 In particular, in the display device according to the light emitting element is provided in the pixel by pixel, according to different parts of the lighting frequency of pixel is different, so as the parts of different degrees of performance degradation is different. 因此，点亮频率越高的象素其性能下降就越严重，表现为出现图象保留（焼爸C爸）现象，使画质下降。 Thus, the higher the frequency of the lighting pixel which performance degradation is more severe, characterized by the presence reserved image (C firing father Dad), thus making the degradation of image quality. 因此，通过在通常使用状态下不进行但在充电等时才予以显示，由此使使用频率低的象素点亮，就可以使图象保留现象变得不明显。 Thus, by not only be displayed, but the charging in the normal use state, etc., whereby the low-frequency lighting pixels, so that image sticking phenomenon can be made inconspicuous. 就充电时的显示内容而言，可以是全点亮、标准图象（待机画面等）明暗反转的图象、为检测使用频率低的象素而显示的图象等。 The contents displayed during charging, it may be a full lighting brightness inverted image, the standard image (a standby screen, etc. ), an image as the low frequency detection pixels and displayed. 图14是与该图对应的方框图，CPU 2001获得了从充电器2017而来的充电状态检测信号，为了显示与前述相应的信号，向显示器控制器2004发出指令，使两面发光显示器发光。  FIG. 14 is a block diagram corresponding to the FIG., CPU 2001 obtained state of charge from the detection signal from the charger 2017, with the order corresponding to the display signal, the display controller 2004 issues a command to the dual emission light emitting display . 这样，通过在充电过程中进行旨在降低图象保留现象的发光操作，就能够抑制显示画质变差的问题。  Thus, by performing the light emitting operation aimed at reducing image sticking phenomenon during the charging process, it is possible to prevent display quality deterioration problem. 还有，本实施例可以与实施方案1-4、实施例1-5中的任意一个自由组合。  Further, the present embodiment may be 1-4, in any of Examples 1-5 in combination with a free embodiments. 根据本发明，通过对大面积基板进行选择性的蒸镀，能够获得掩模精度高的大型掩模。  According to the present invention, by vapor deposition on a large area substrate selectivity can be obtained with high accuracy mask a large mask. 还有，根据本发明，提供了蒸镀装置，利用该装置，即使是对于大面积基板，也能够在整个基板表面上获得均一的膜厚。 Further, according to the present invention, there is provided a vapor deposition apparatus, with the device, even for a large area substrate, it is possible to obtain a uniform film thickness over the entire surface of the substrate. 1. 制造装置，其是包含载入室、与所述载入室相连的运送室、与所述运送室相连的多个成膜室和与所述成膜室相连的设置室的制造装置，其特征在于， 所述多个成膜室与用于将所述成膜室内部排真空的排气室相连，所述多个成膜室包含固定基板用装置、掩模、固定该掩模用框架、对准该掩模和基板用的对准装置、1个或2个蒸镀源、使该蒸镀源在所述成膜室内部移动的装置和加热基板用装置，和所述掩模的端部是粘结在与通过所述框架构件的热膨胀中心的线重合的位置上的。 1. manufacturing apparatus, comprising a loading chamber that is, the transport chamber and the manufacturing apparatus connected to loading chamber, a plurality of film formation chambers connected with said transport chamber and provided with a chamber connected to the film forming chamber, wherein said plurality of film deposition chambers and the interior of the film-forming chamber for discharging an exhaust chamber connected to a vacuum, the deposition chamber comprises a plurality of fixing the substrate means, a mask, the mask is fixed with frame alignment means aligning the mask and the substrate, one or two evaporation sources, so that the vapor deposition source and the substrate is heated in an apparatus that moves inside the film forming chamber by means of the mask, and an end portion of the wire is bonded by thermal expansion of the center of the frame member coincides with a position. 2. 权利要求1的制造装置，其还包含用于贮存置于所述蒸镀源中的蒸镀材料的容器的平面的截面是长方形或正方形的，而且开口部分是细长形状的。 2. A manufacturing apparatus as claimed in claim 1, further comprising a reservoir container disposed in said cross-sectional plane of the vapor deposition material in the deposition source is a square or a rectangle, and the opening portion is an elongated shape. 3. 权利要求1或2的制造装置，其特征在于，所述成膜室和所述设置室包含能将材料气或清洗气体引入的装置并且与用于使所述室内部排真空的排气室相连。 Manufacturing apparatus of claim 1 or claim 2, wherein said deposition chamber and said setting means comprises a chamber capable of introducing a material gas or a cleaning gas and the discharge chamber for a vacuum inside the vent connected to the chamber. 4. 权利要求1或2的制造装置，其特征在于，所述蒸镀源在所述成膜室内可沿X方向、 Y方向或Z方向移动。 Manufacturing apparatus of claim 1 or claim 2, wherein the evaporation source may, Y direction or Z direction in the X direction in the deposition chamber. 5. 权利要求1或2的制造装置，其特征在于，在所述成膜室中设置用于将所述成膜室内部分割并阻止向所述基板上的蒸镀的开合门。 Manufacturing apparatus 1 or claim 2, wherein, in said film forming chamber is provided for dividing the interior of the film-forming chamber and prevent the deposition on the substrate opening and closing the door. 6. 权利要求2的制造装置，其特征在于，所述容器是由上部分和下部分构成的，并且来自所述蒸镀源的蒸镀材料的蒸发是通过所述容器上部分中的开口部分的形状来调节的。 6. A manufacturing apparatus as claimed in claim 2, wherein the container is constituted by an upper portion and a lower portion, and evaporated deposition material from the deposition source is the opening portion of the container portion by the shape is adjusted.